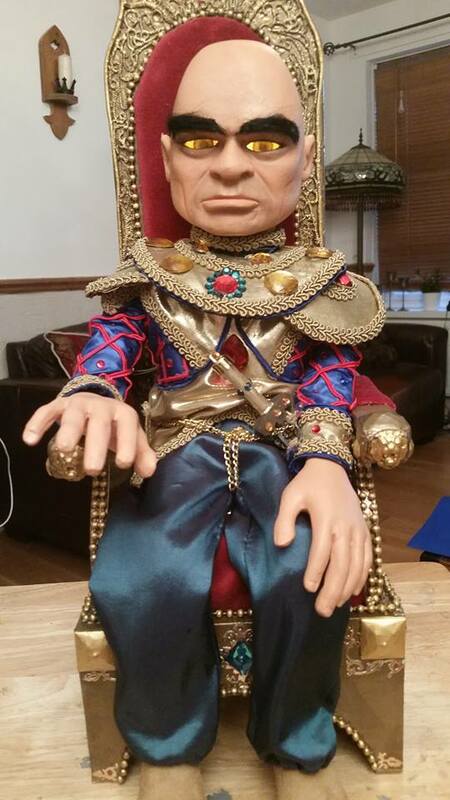 This page is dedicated to showing puppets and props which have been made by my customers using kits supplied by me. My grateful thanks to the talented people - credited individually below - who have allowed me to show pictures of their work. 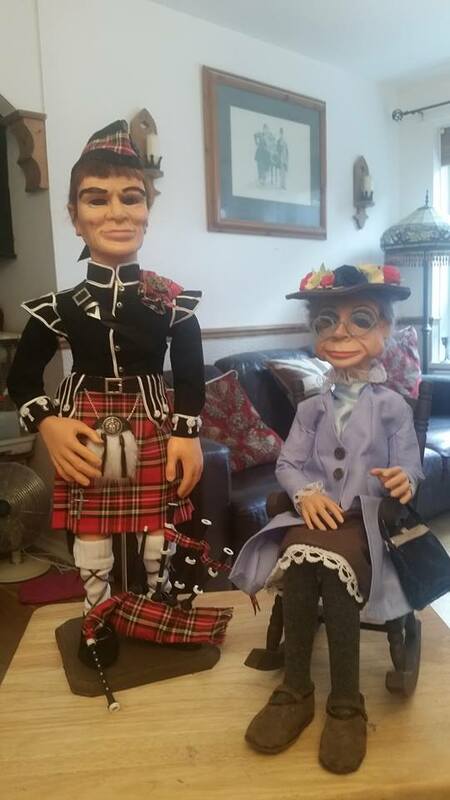 These fabulous recreations of the quirky Hillbilly characters were made by Mark and Amanda in London. supplied by me; Mark and Amanda took care of the rest. 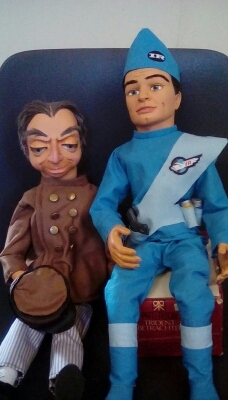 I do love to see different characters being replicated, and this wonderful pair is certainly about as different as they come in Thunderbirds. 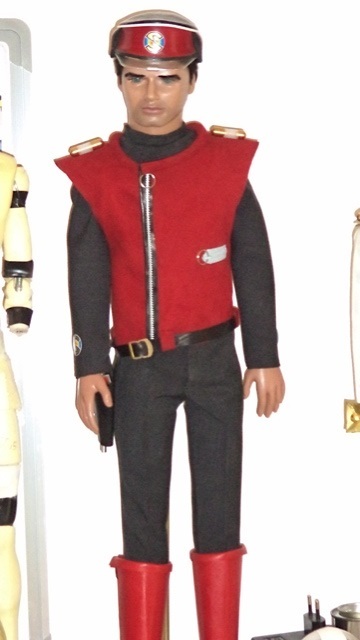 Glenn, in Queensland, Australia has made this fantastic replica of Captain Scarlet using one of my kits. 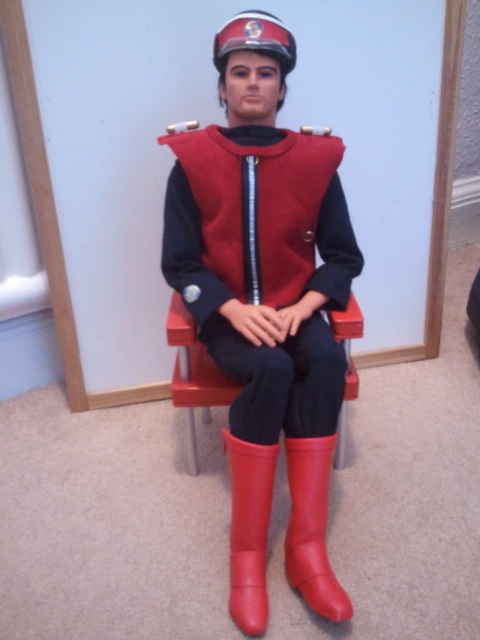 INCREDIBLY, this is Glenn's first attempt at making a replica Supermarionation puppet. 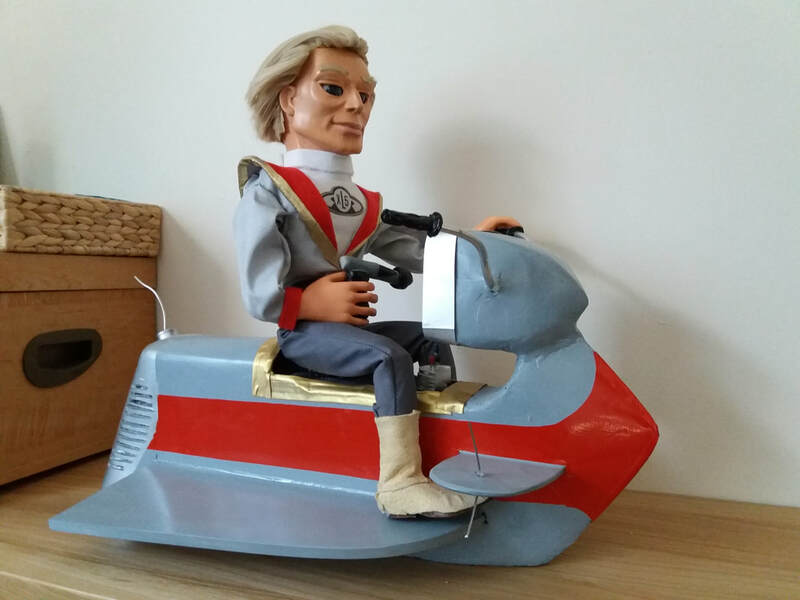 There are a lot of fans of Gerry and Sylvia Anderson's shows all over the world, and I'm very pleased indeed whenever I have a customer from another part of the globe. 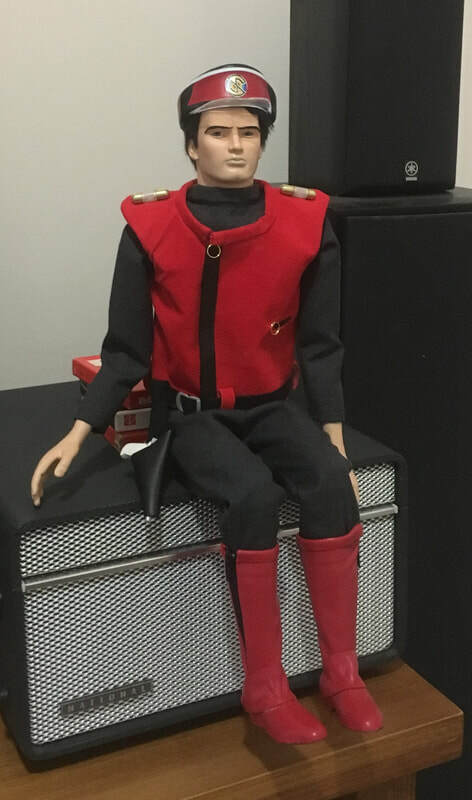 I'm absolutely delighted that this Captain Scarlet kit has made it from England - home of Supermarionation - all the way to Australia, and that it has been so well made by a true fan of the shows. 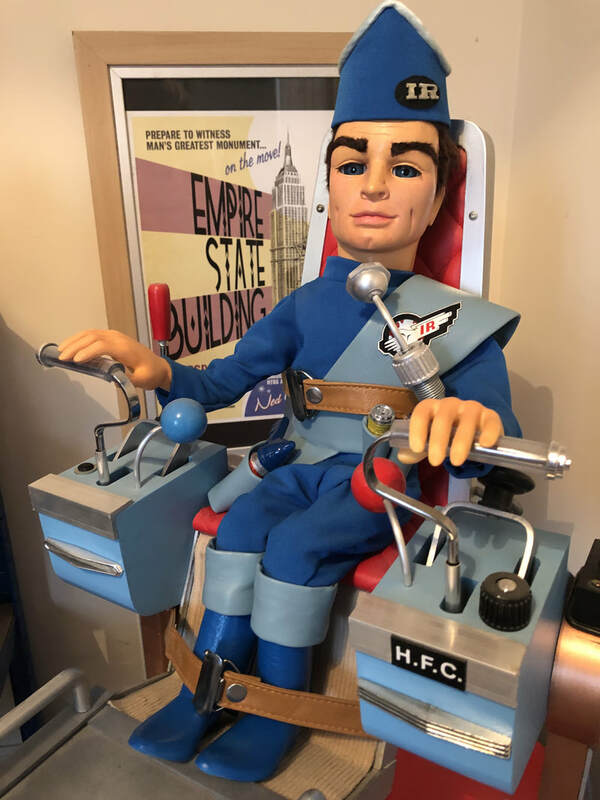 Andrew, of Hadrian's Hobbies in Cumbria, England has taken his replica puppet-making of classic Thunderbirds characters to a WHOLE NEW LEVEL! 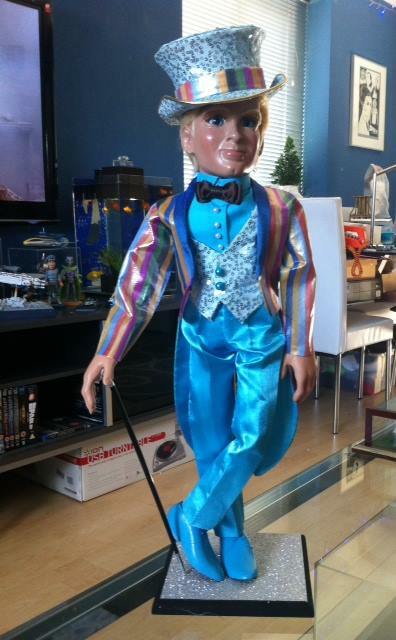 Andrew has posed his replicas FREE-STANDING and perfectly balanced without the use of strings, nor of support stands. In addition to that he has photographed them with floor and wall backdrops for added realism. 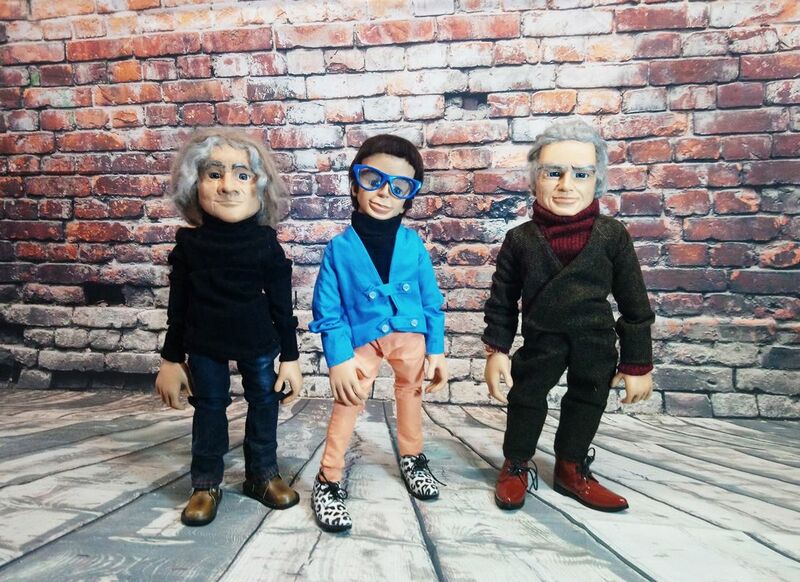 Thank you so much for allowing me to share it here, Andrew (That's Andrew's puppet likeness standing there in this picture with Brains and Jeff Tracy). 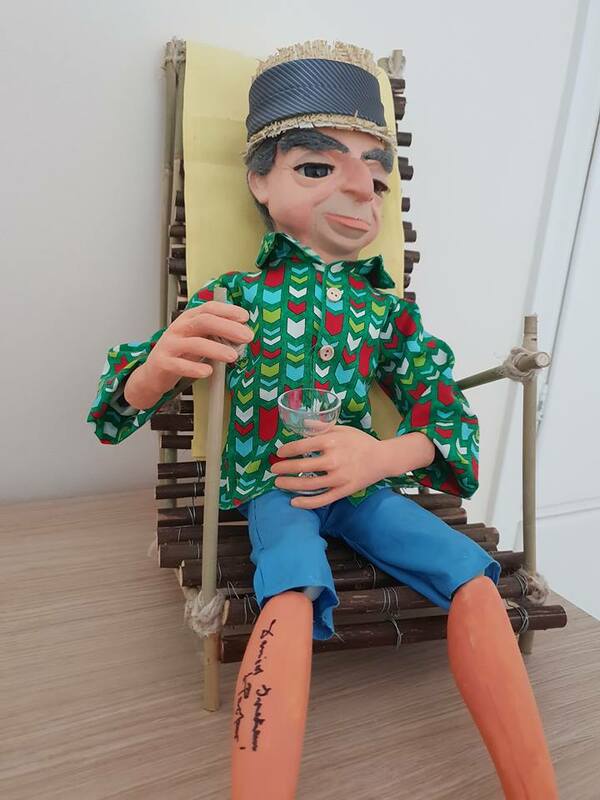 Cheque out this replica HALIFAX advert Parker, enjoying his winnings in a beach chair, made with loving attention to detail by Jamie in Scunthorpe. 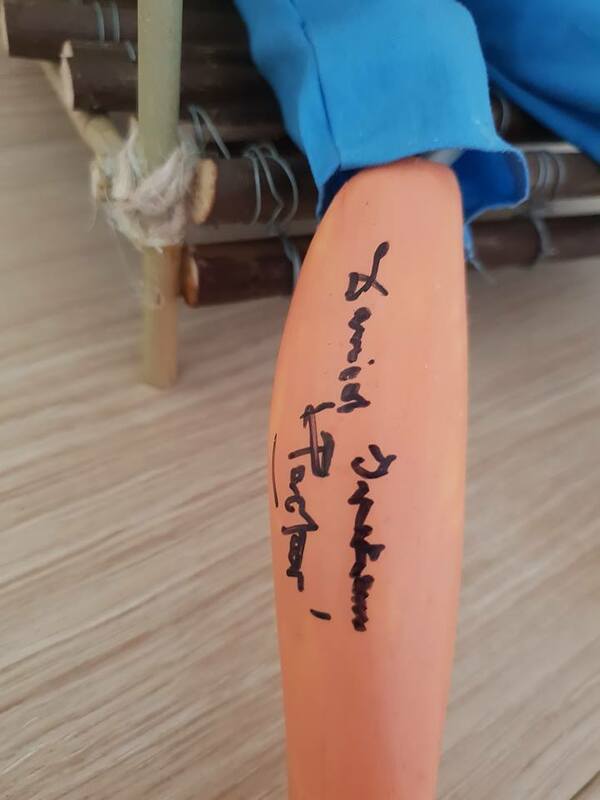 This highly unusual build even features a "Tat" on Parker's right calf - an autograph by none other than the legendary DAVID GRAHAM, the one and only original voice of Parker. On no account should this build be ignored; you can bank on Jamie's HALIFAX Parker generating a lot of interest. 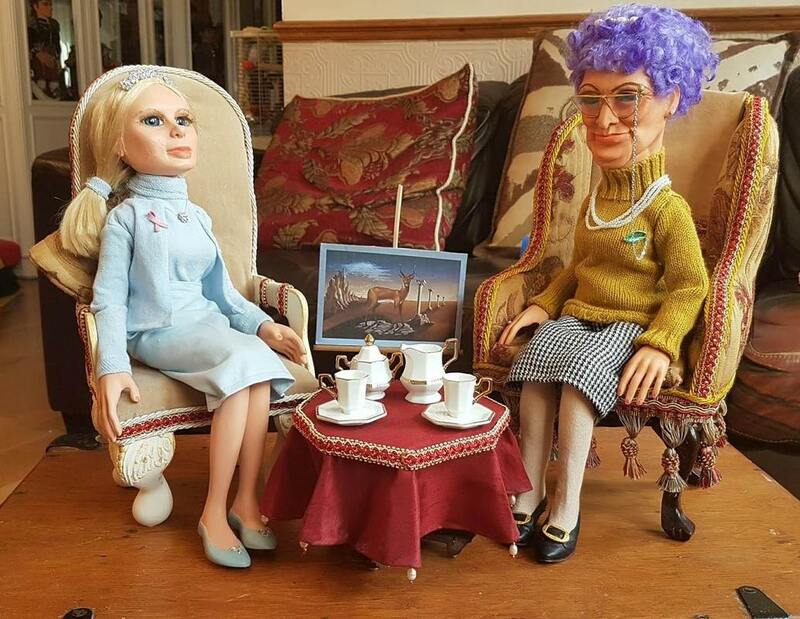 Andrew, who owns HADRIAN'S HOBBIES in BRAMPTON, CUMBRIA has made a lovely job of replicating Tin-Tin and her father, Kyrano, as well as posing Tin-Tin in a replica Tracy lounge Chair which he made using one of my laser-cut kits. Tin-Tin is looking very sultry, and sporting a lovely pair of knee-high boots. You can see more of Andrew's excellent builds further down this page. 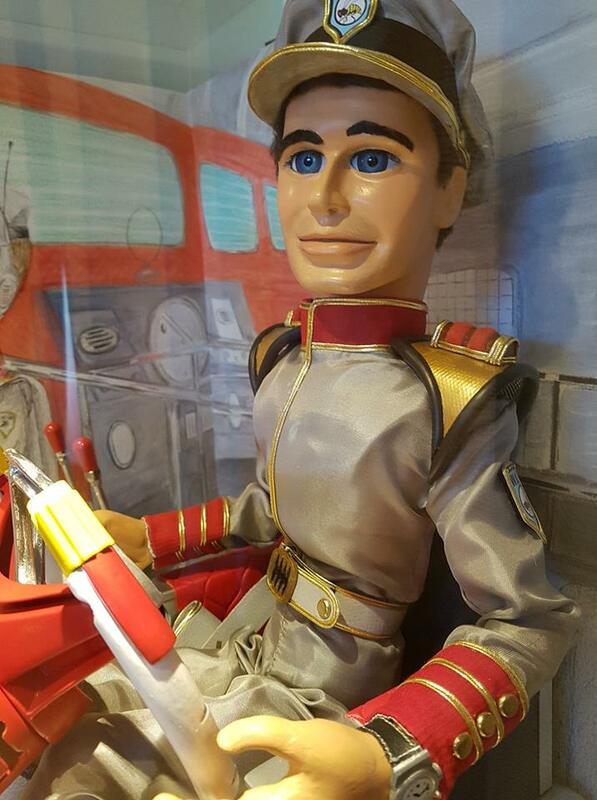 Huge thanks to Isabelle in Canada for this lovely picture of the wonderful Captain Ochre puppet replica she has made using one of my kits. 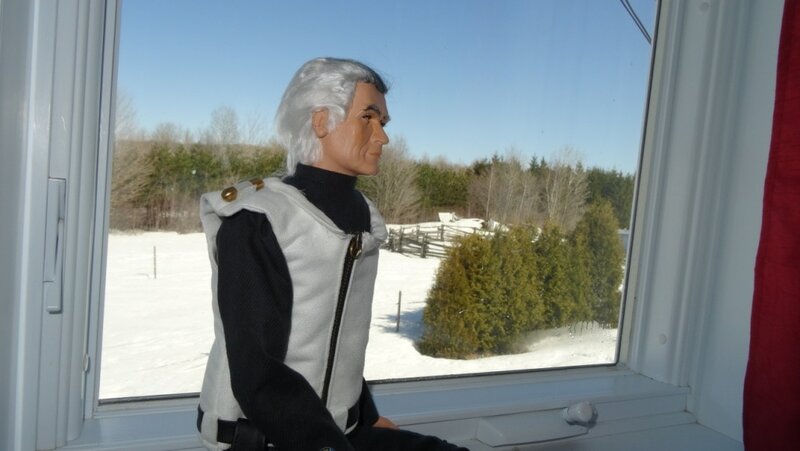 Captain Ochre looks very relaxed in his Canadian home, although that may change if Isabelle's replica of Colonel White (see him further down this page) catches him chilling on the job! 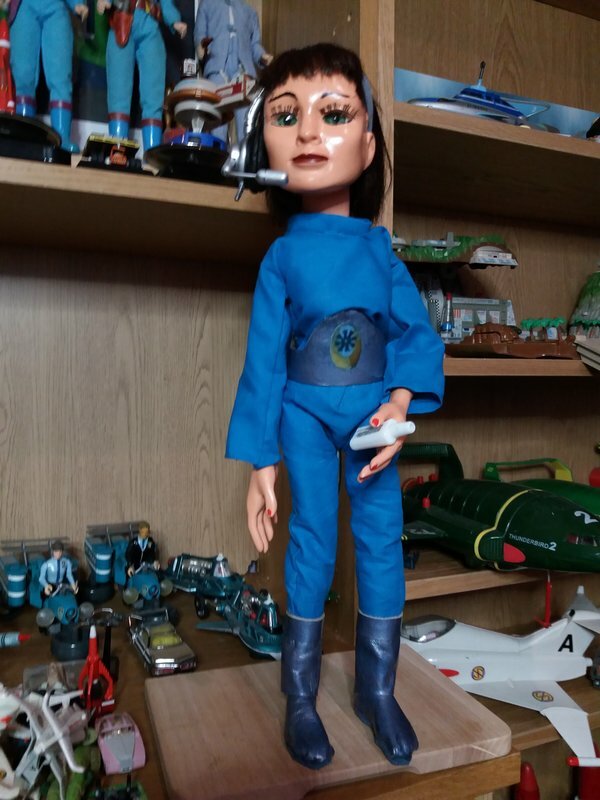 I happen to know that Isabelle has plans to make a Thunderbirds character next, and I'm very much looking forward to seeing the finished result. Three pictures of the really excellent Troy Tempest, Stingray Control Wheel, and Stingray Injector Seat built by Paul Harrison in Surrey, England. 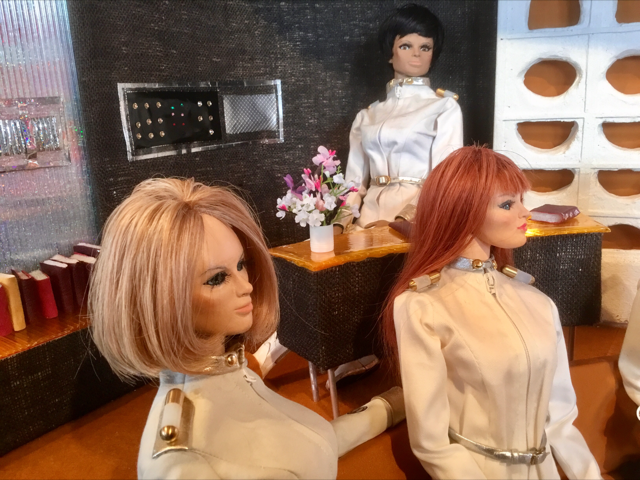 Paul has displayed his Troy and props against a painted backdrop showing Phones and the interior of Stingray, but I believe that he has plans to build further studio-scale puppets and props for this set. STAND BY FOR MORE ACTION! 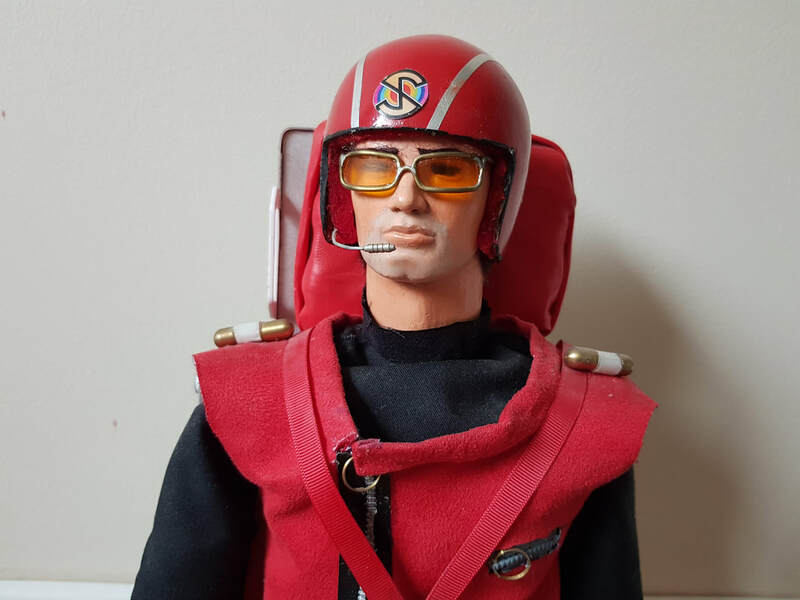 (Troy's head, Injector Seat and Stingray Control Wheel were all made by Paul using SUPERPROPREPLICATION casts and kits, whilst he scratch-built Troy's body, all of Marina, and the other parts of the display). BRILLIANT work Paul. Many thanks for sharing. 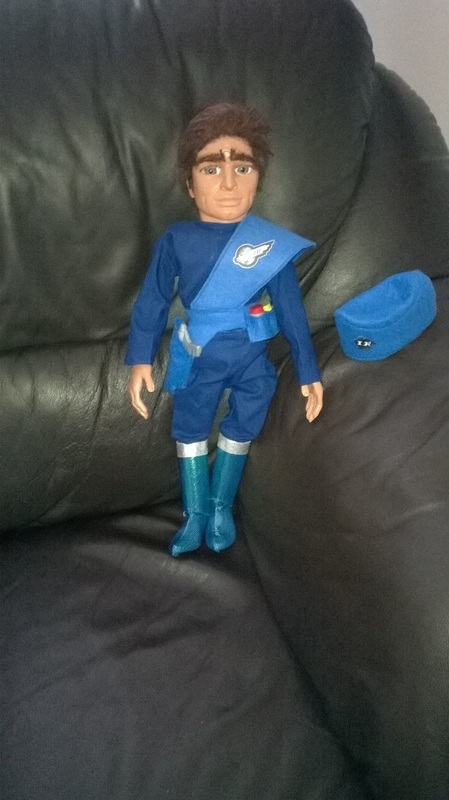 Here's the MIGHTY TITAN from Stingray, made by Paul Harrison of Surrey, England. Paul has made a superb job of this build - one of the more rare characters in terms of replication by my kit customers. Paul has achieved a very polished and accomplished finish on all aspects of this character, and I'm very much looking forward to seeing more of his work on this page. SHALL I GET THE 'ORSE, M'LADY...? 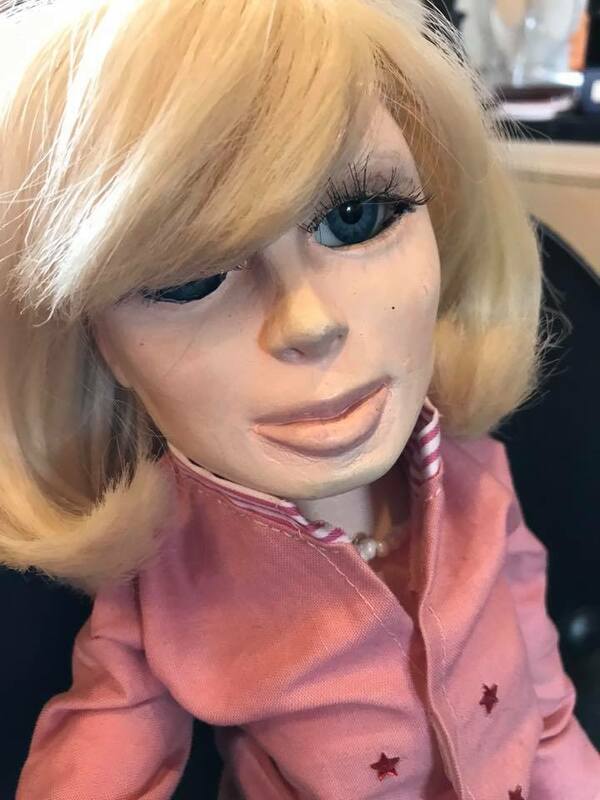 Mark and Amanda in London have done it again, with this highly unusual version of Lady Penelope in an outfit from one of her two big-screen appearances. It's great to see a new take on a familiar character. AWESOME work, Mark and Amanda! Thanks for sharing. 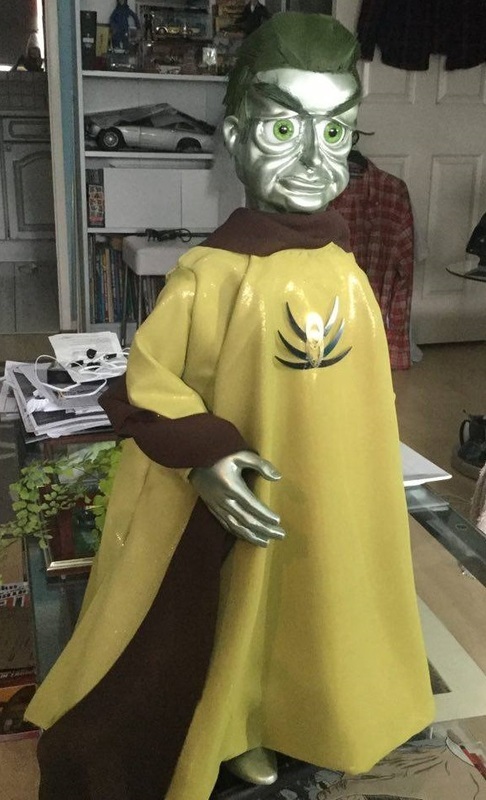 Bill in Milton Keynes has made this wonderful replica of the statue of Kyrano in The Hood's jungle lair. I love to see novel and unusual sets and props being replicated, so my eyes really lit up when I saw Bill's excellent, inventive work. Thank you Bill for allowing me to share your pictures here. 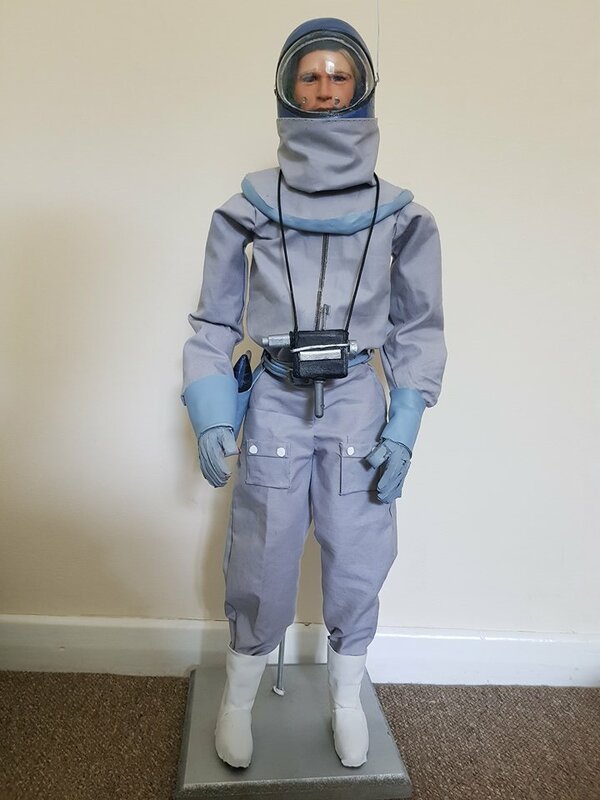 has added to his already very impressive collection of replica Supermarionation characters with this fantastic recreation of Doctor Fawn from Captain Scarlet. I happen to know that Jamie has recently become a Dad again; congratulations on the new addition to your family Jamie! 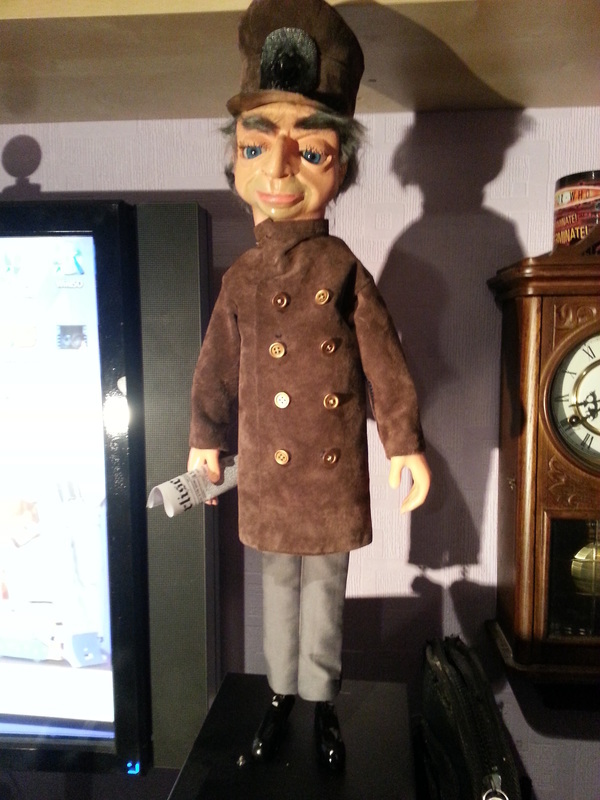 Here's another fabulous build by Mark and Amanda in London - Father Stanley Unwin from The Secret Service. 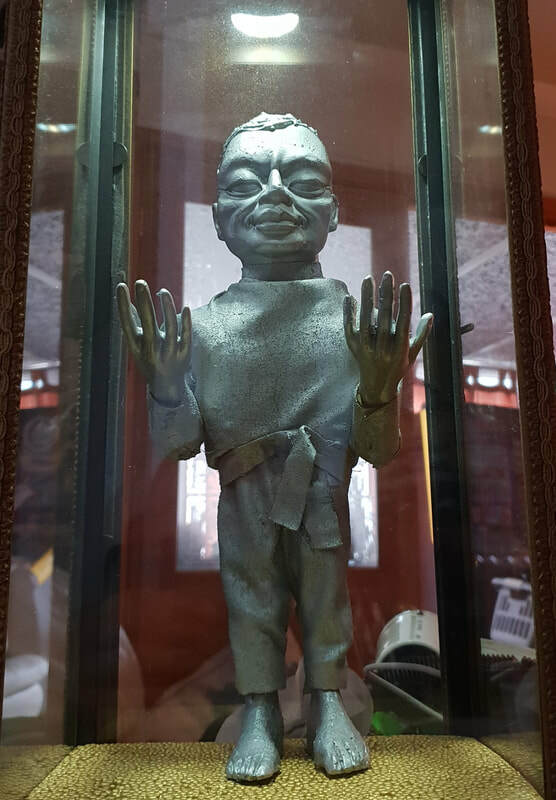 The original sculpt of the puppet Unwin's head is an amazing piece of work and an incredible likeness to the real Stanley Unwin on which it was based. 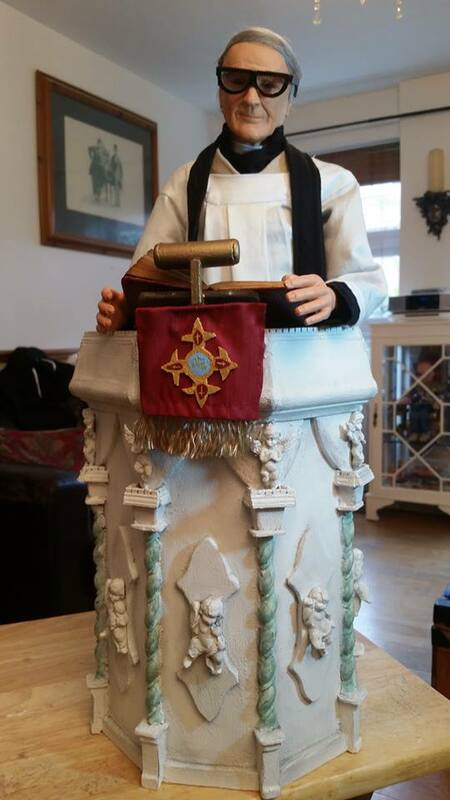 Mark and Amanda have once again gone the extra mile and made their replica puppet a beautiful pulpit in which he can be posed. I know from experience that Joe isn't the easiest of builds because he's so small, so this beautiful replica is especially impressive! 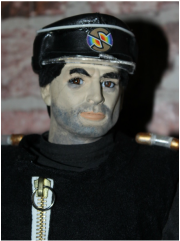 (from the Thunderbirds episode 'Martian Invasion'). 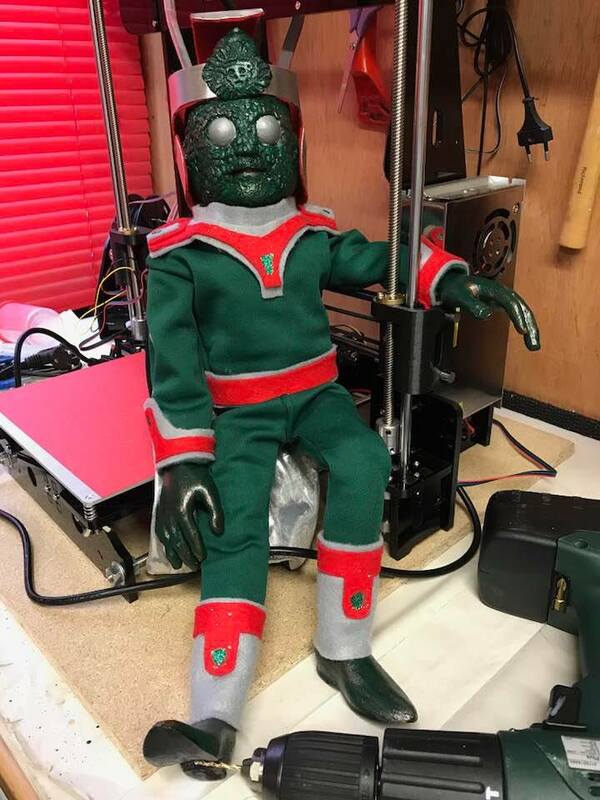 Here's Richard's Martian relaxing with a 3D printer - something that seems like real life science fiction to me! 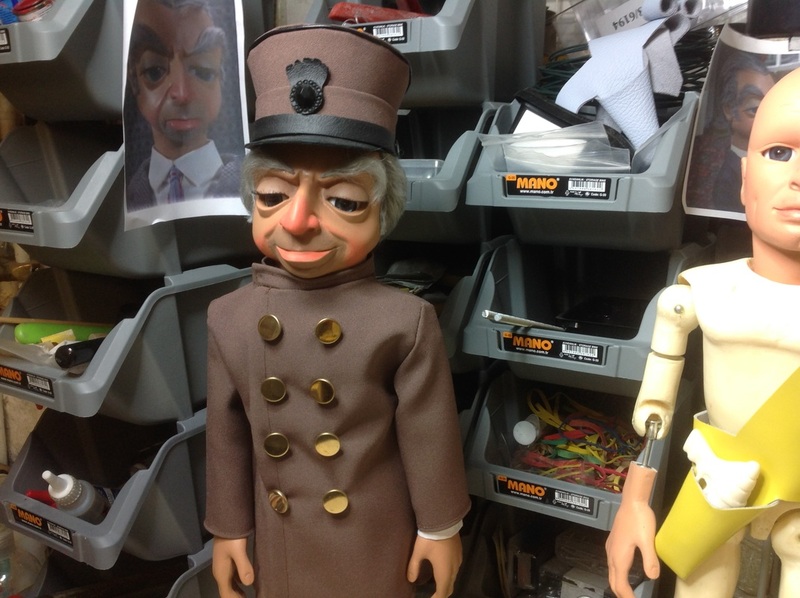 EXCELLENT work Richard in bringing this quirky and fun character to life! I know you have a lot more builds on the go, and I'm looking forward to sharing them here (with your permission, of course!). This a quite stunning build by James. 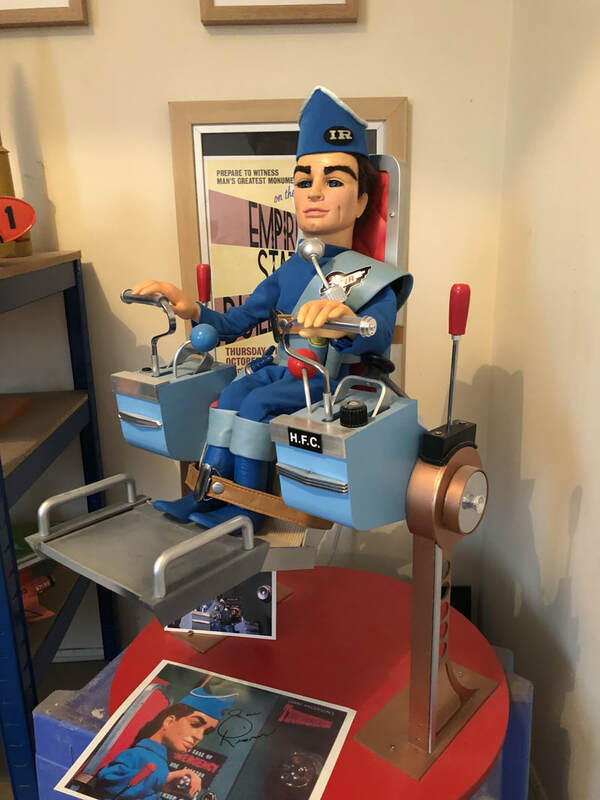 He scratch-built the studio-scale TB1 Pilot's Seat for his replica Scott (puppet kit from SUPERPROPREPLICATION), making an incredibly impressive display. The detail and finish of James' work is a joy to behold! Many thanks for allowing me to share your work here James. I'm already looking forward to seeing pictures of your next build. I'm the first to admit that my Braman kit isn't the easiest of builds; the casts must be very carefully cleaned-up and prepared prior to painting, and the joints made so that they don't show. Lee has done a superb job of completing this build, including lighting Braman's face-plate with EL foil. Top quality work from Lee here! 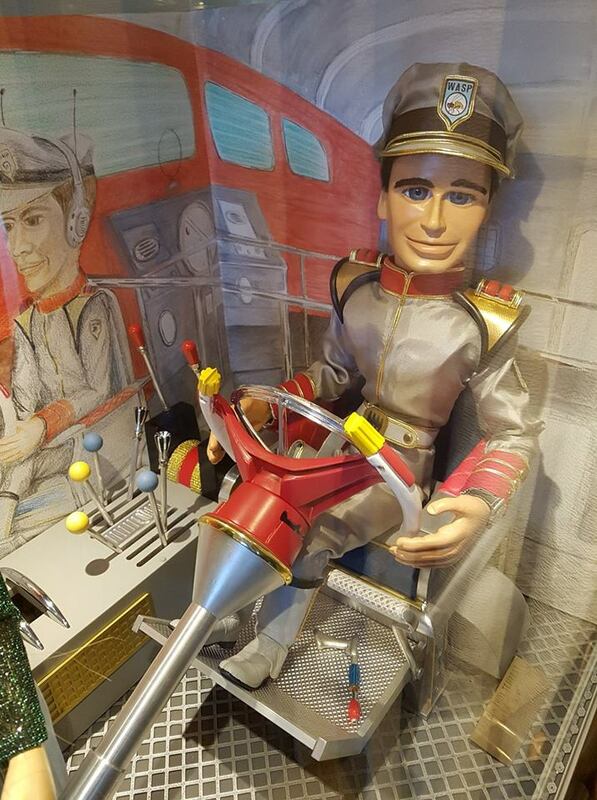 I'd love to see this Braman posed seated at a table, playing chess with Brains in a recreation of a scene in the Thunderbirds episode 'Sun Probe'. 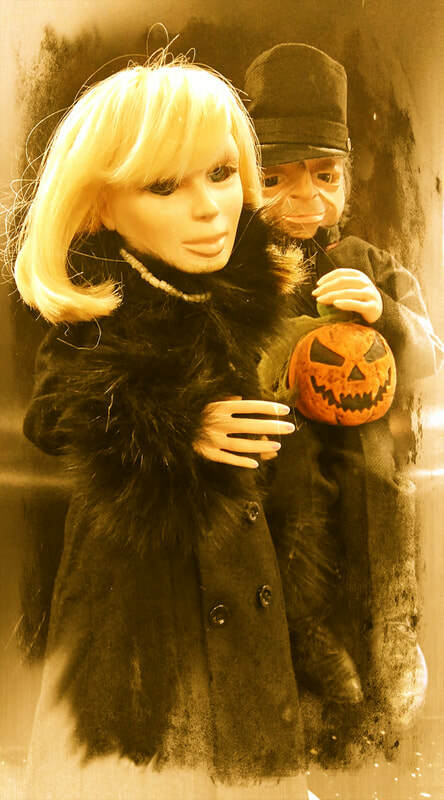 From Lady Penelope and Parker. 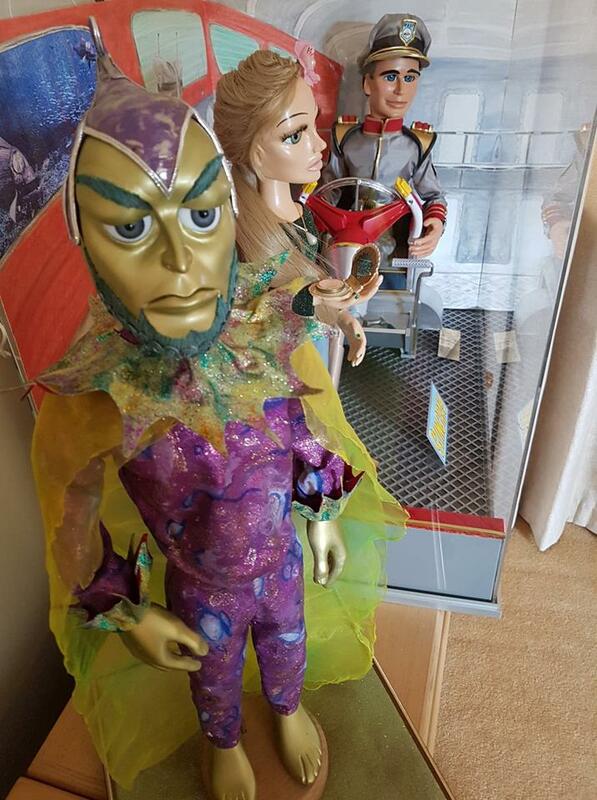 Jill, from Mid-Wales has made this absolutely outstanding replica of the Angels' Amber Room in which to pose her beautiful replica Destiny, Symphony, Melody, Harmony and Rhapsody Angel puppets. 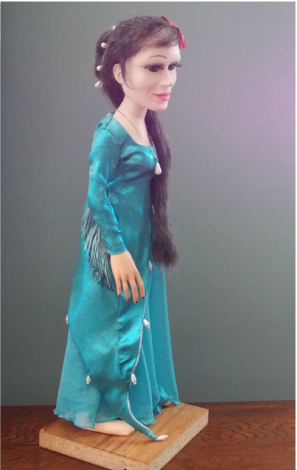 I'm completely blown away by Jill's set and her puppets, and very grateful indeed that she has allowed me to share her superb work here. 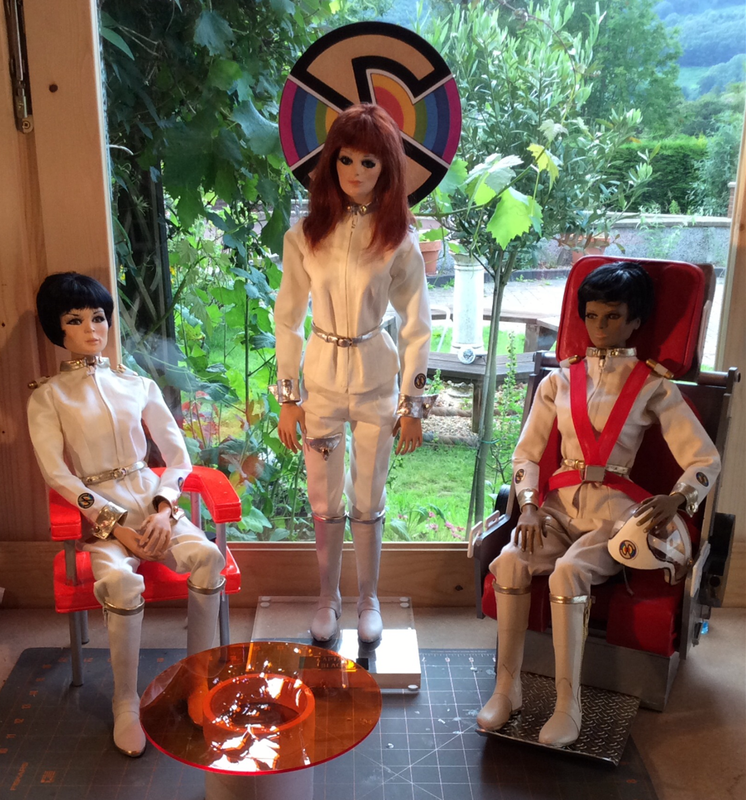 Jill tells me that she is still working on completing the part of the set where Angels two and three are waiting to be called to action in their ejector seats behind sliding amber Perspex panels. I can't wait to see the whole set finished. I'm completely in awe of the quality of Jill's work. 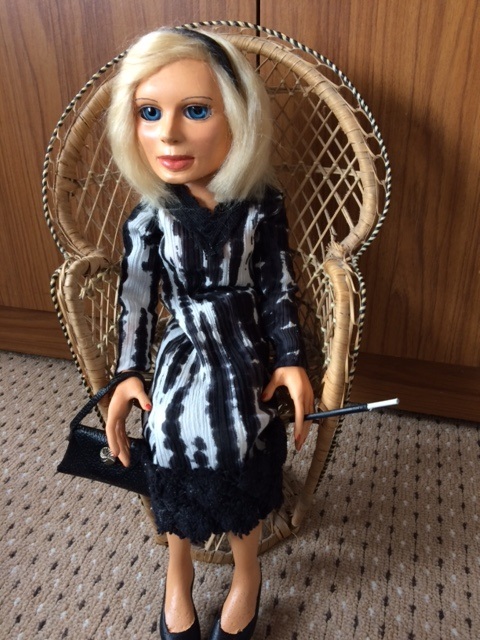 of BRAMPTON, CUMBRIA has re-dressed his replica Lady Penelope for some Halloween fun! 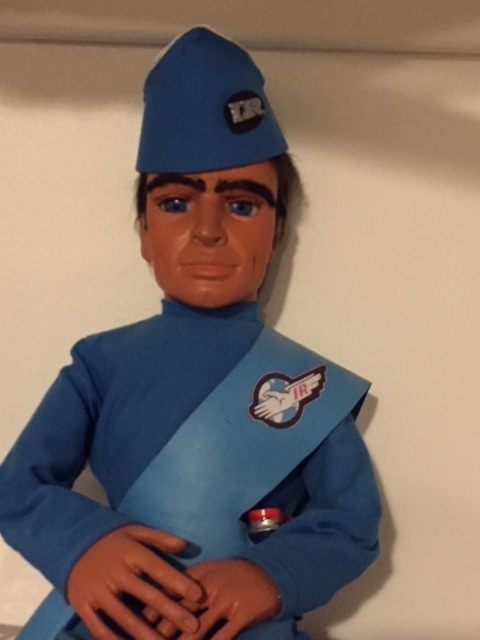 You can see Andrew's builds in more traditional Thunderbirds garb further down this page. 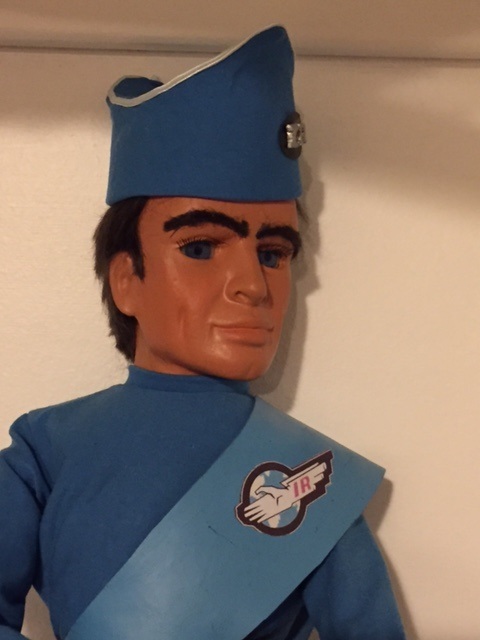 of Montreal, Canada joined forces to imagine Jeff Tracy getting out from behind his desk and into a Thunderbirds uniform. It's always good to see a new take on a familiar character; Jean-Pierre and Suzanne are clearly thinking outside the box. 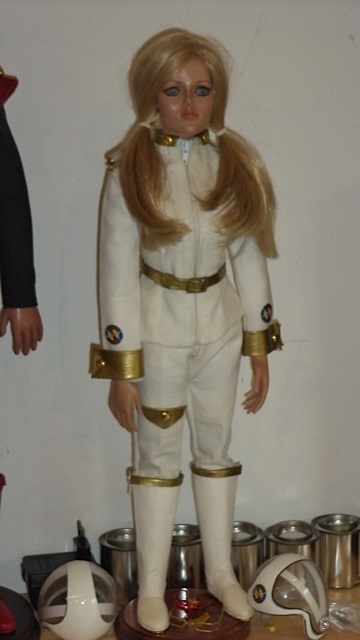 ...made this lovely replica of Tin-Tin in her Thunderbirds uniform. 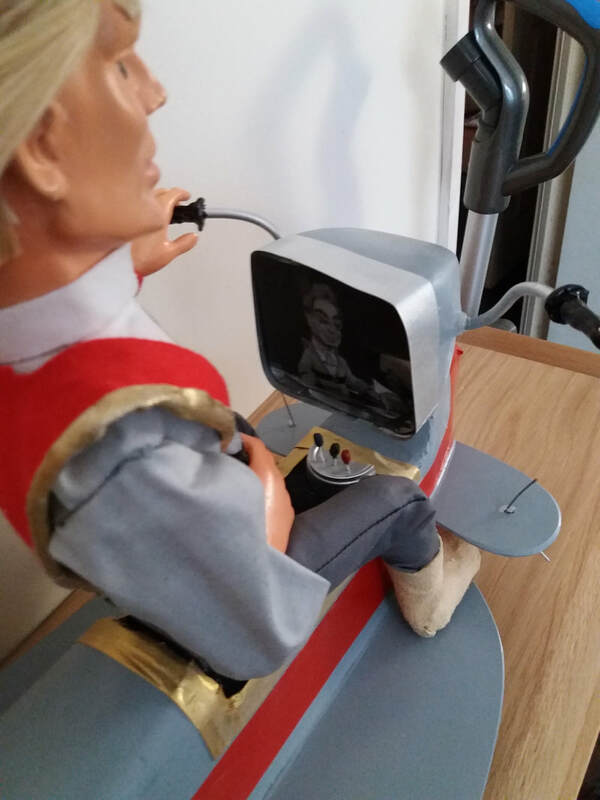 In the true spirit of Supermarionation, Bill scratch-built Tin-Tin's headset using salvaged components from an old Dictaphone. 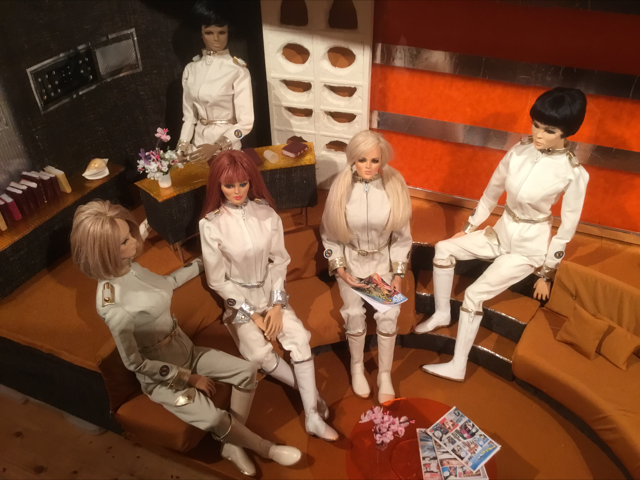 ...with this stunning display of Lady P having tea with The Duchess of Royston (body by SUPERPROPREPLICATION, resculpt head from elsewhere). 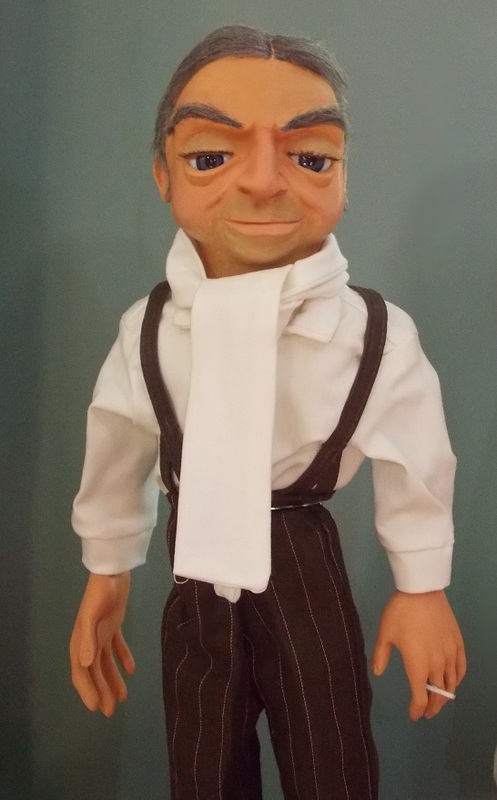 Talented Jamie, from Scunthorpe, is one of my longest-standing customers for puppet and prop kits. 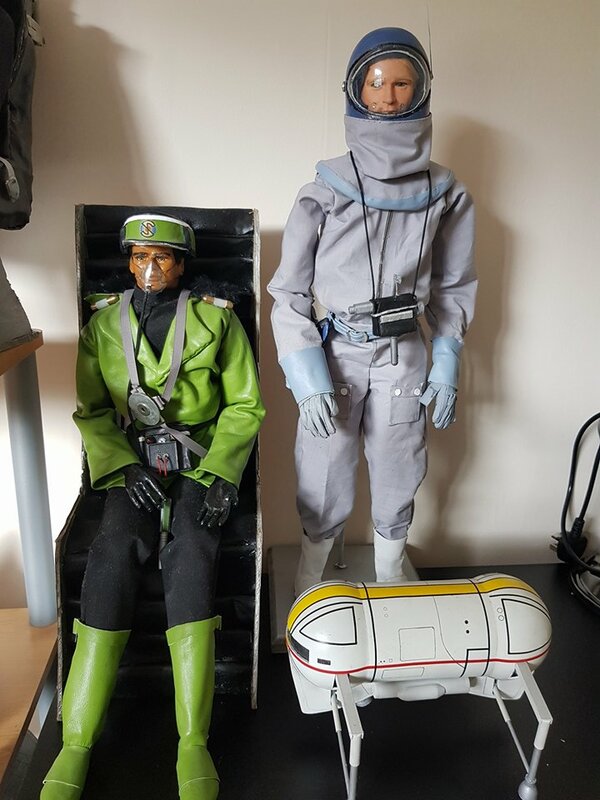 Shown here is a selection of Jamie's excellent work, including his brilliant scratch-builds of a Spectrum SPV seat and Troy Tempest's wet-suit and SCUBA gear; beautiful designs which I have never before seen replicated. 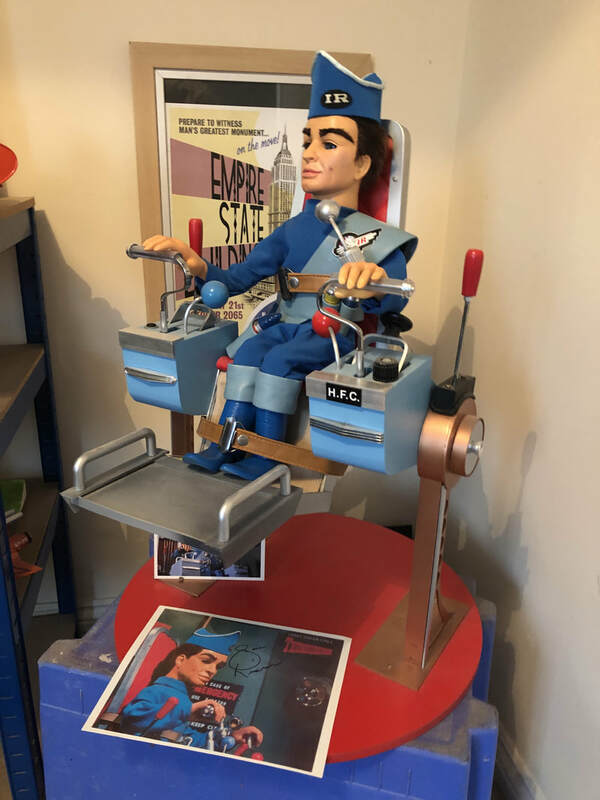 Jamie's love for all things Supermarionation is evident in everything that he makes; like me, he is a fan of recreating puppet-scale seats and props with which to display his wonderful replica characters. Thank you Jamie for allowing me to share your work here; I know that it will inspire others. 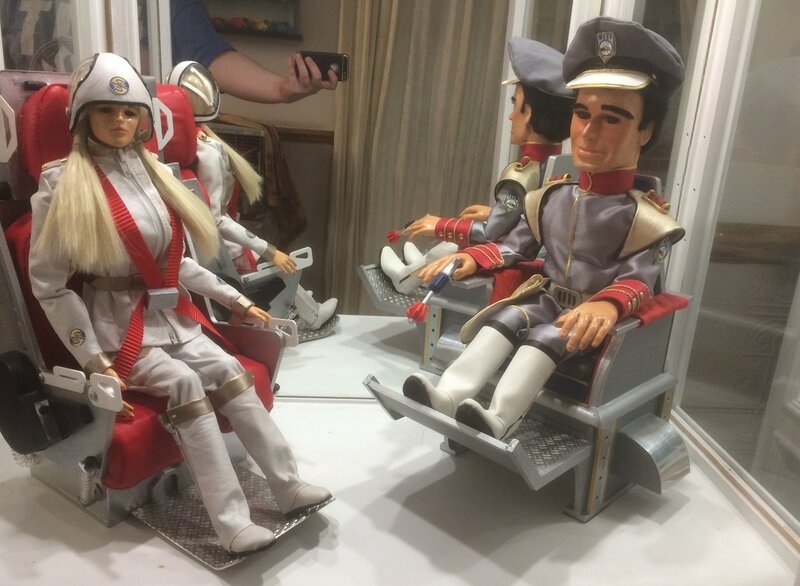 ABOVE: Jamie's Captain Magenta and Captain Brown with scratch-built MSV seat; Scott Tracy with his (Superpropreplication kit) Hoverbike; Lieutenant Green in winter coat with scratch-built respirator; Captain Black with scratch-built pilot's seat; Captain Scarlet with (Superpropreplication kit) Ejector Seat. 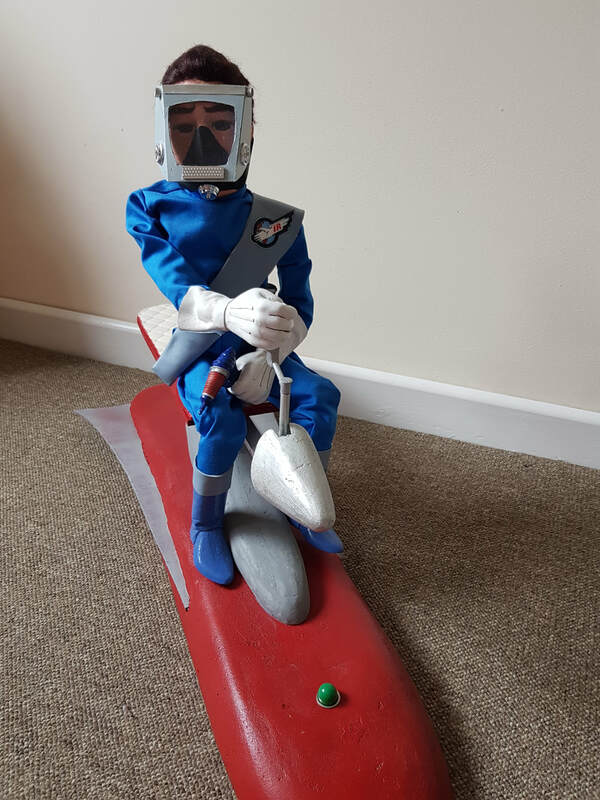 Bill not only made a great job of building a Steve Zodiac (Fireball XL5) kit which he bought from me, but he also scratch-built a fantastic replica of a puppet-scale Jetmobile on which to display him. 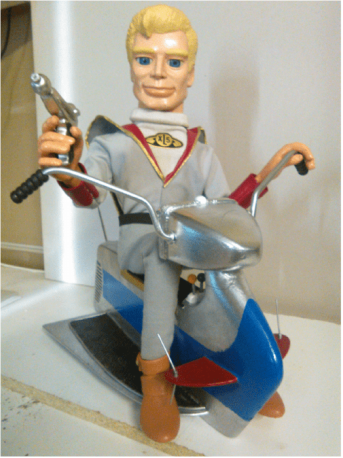 I love to see replica puppets supported by puppet-scale props, and to my mind there's no better way to display Steve Zodiac than seated on a Jetmobile; it really captures the look and feel of the original series. 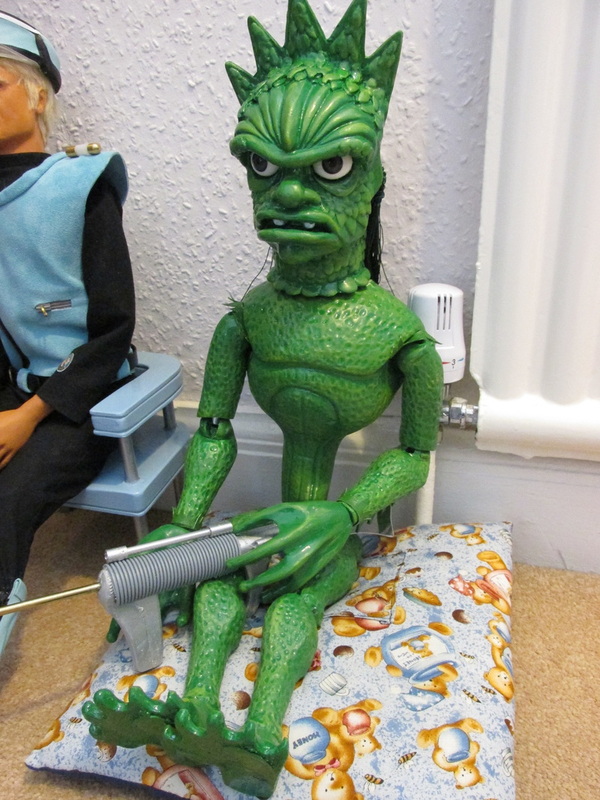 Bill has also made this beautiful replica of Marina from Stingray. 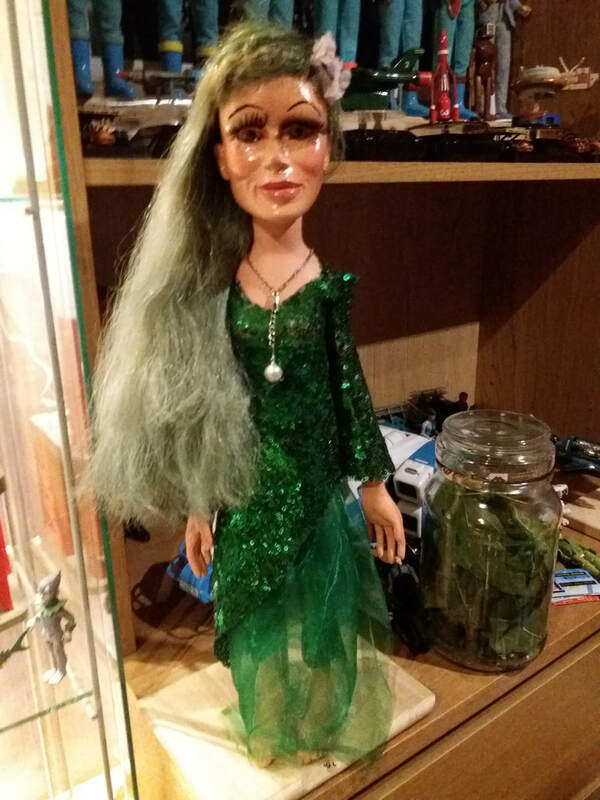 Like many makers of replica puppets (myself included), Bill admits to finding sewing the costumes a challenge, but he has managed to replicate both Zodiac's and Marina's outfits brilliantly. 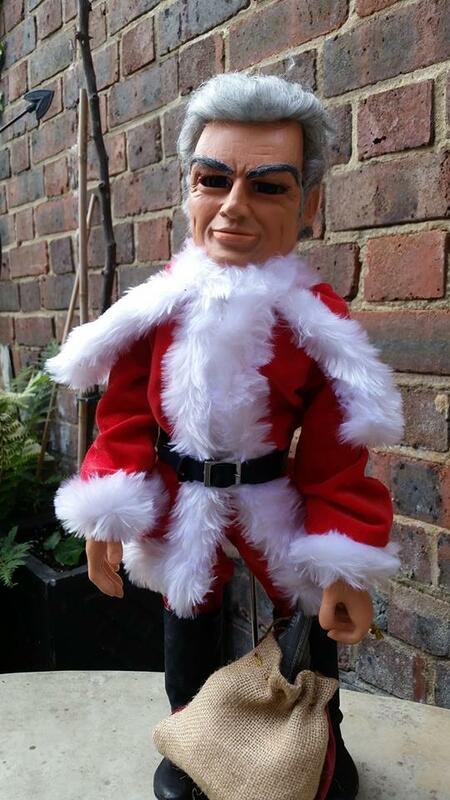 ...and Mark and Amanda in London are getting ready with this brilliant replica of Jeff Tracy dressed as Santa, recreating how he looked in a scene from the last-ever episode of Thunderbirds, 'Give or Take a Million'. 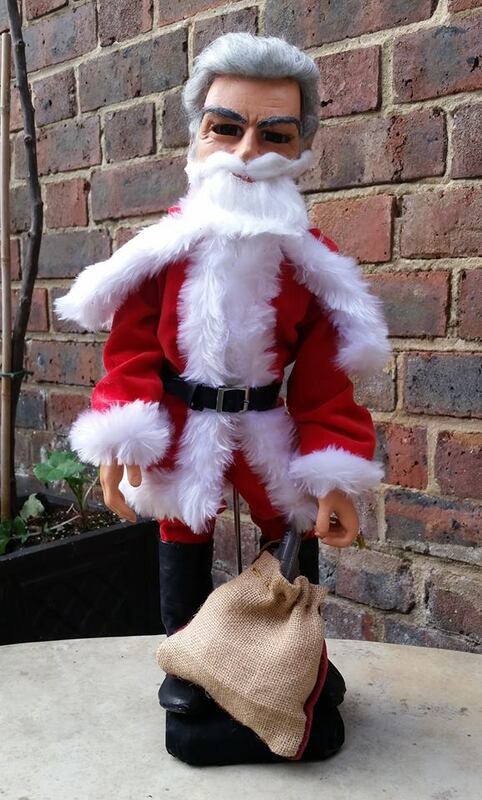 I love to see well-known characters replicated in unusual or one-off costumes, and this Santa Jeff is spot-on. 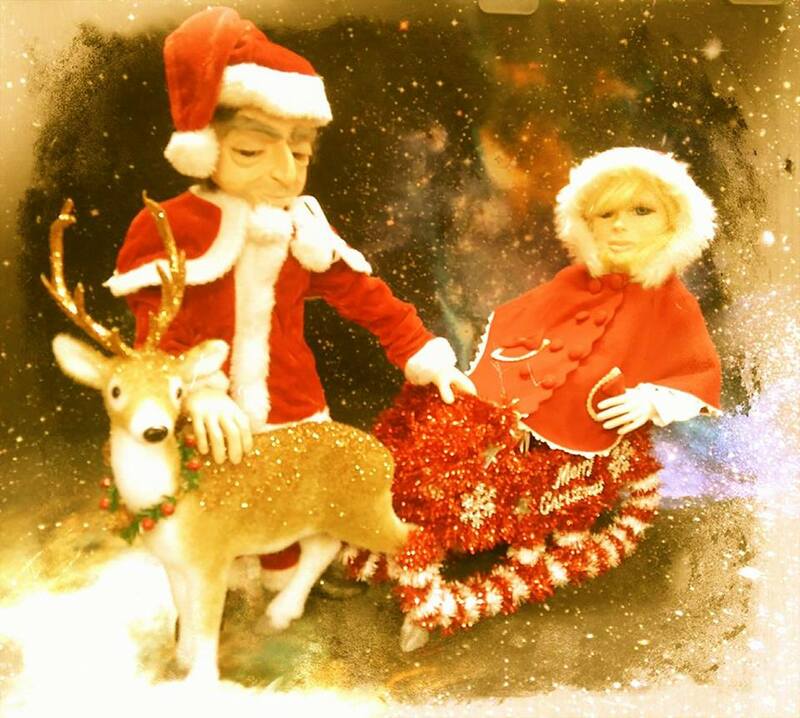 Mark and Amanda have even replicated Jeff's sack of gifts, with a miniature Thunderbird 1 poking out of the top. 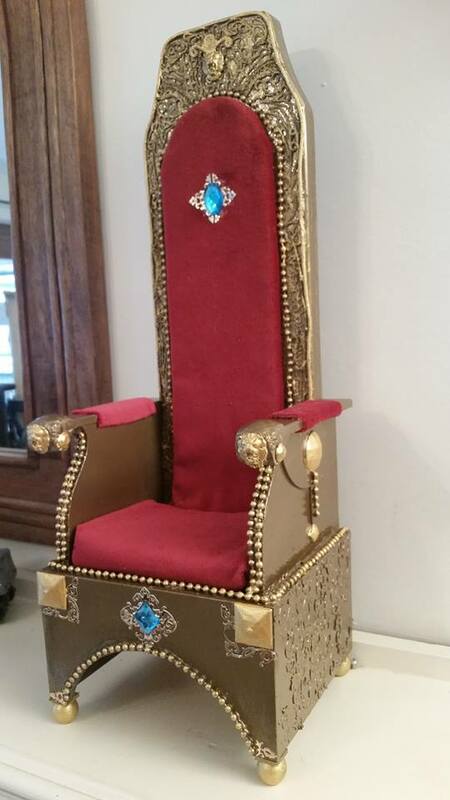 Mark and Amanda in London, have made this stunning replica of the Hood and his Throne. 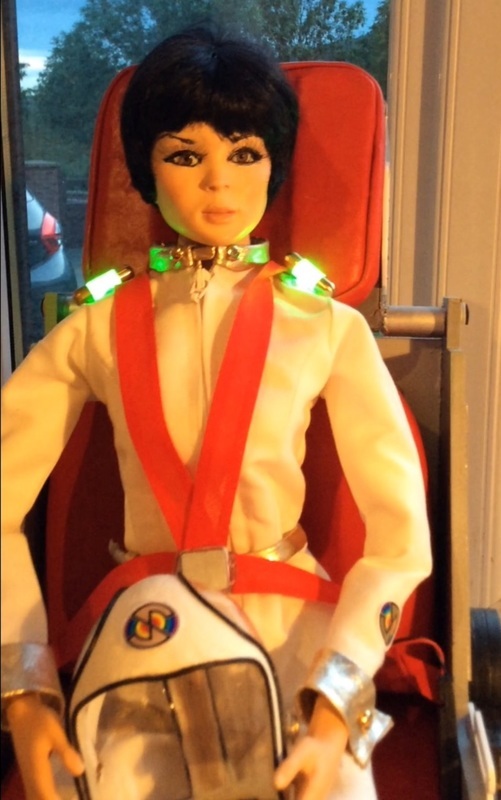 Amanda made The Hood's beautiful bejeweled ceremonial outfit, while Mark built the puppet and created the throne by adapting one of my Stingray Injector Seat kits. 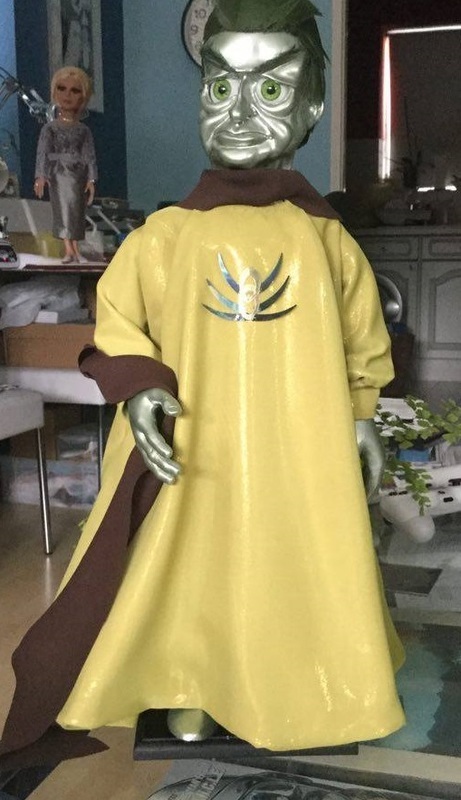 I love to see work like this - it's incredibly well done, and the puppet-scale throne really shows The Hood off to his best advantage. I'm really looking forward to seeing what Mark and Amanda create next. CUMBRIA - has found himself a new hobby. 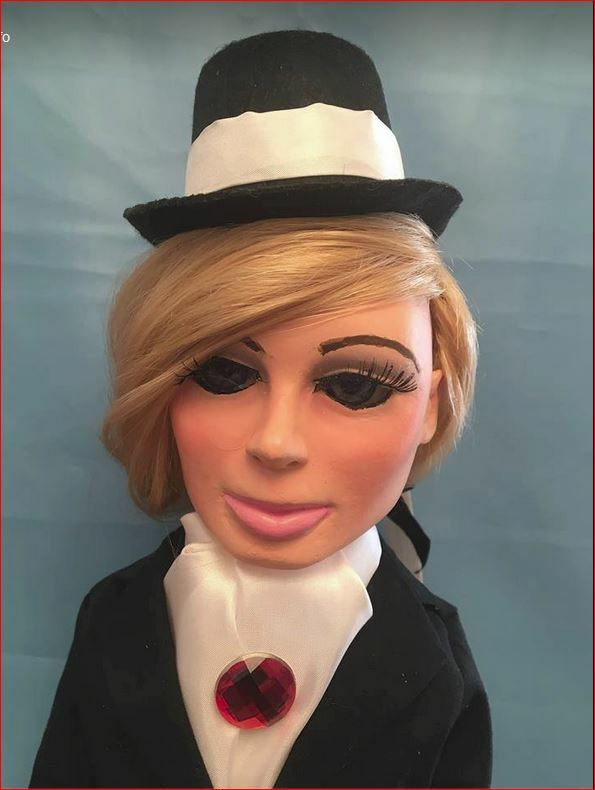 Andrew has just completed this lovely Lady Penelope to join the Parker he recently made which is shown further down this page. This is a "selfie" pic of Penny; Andrew has promised further pictures of her to be taken at a secret location in the near future! 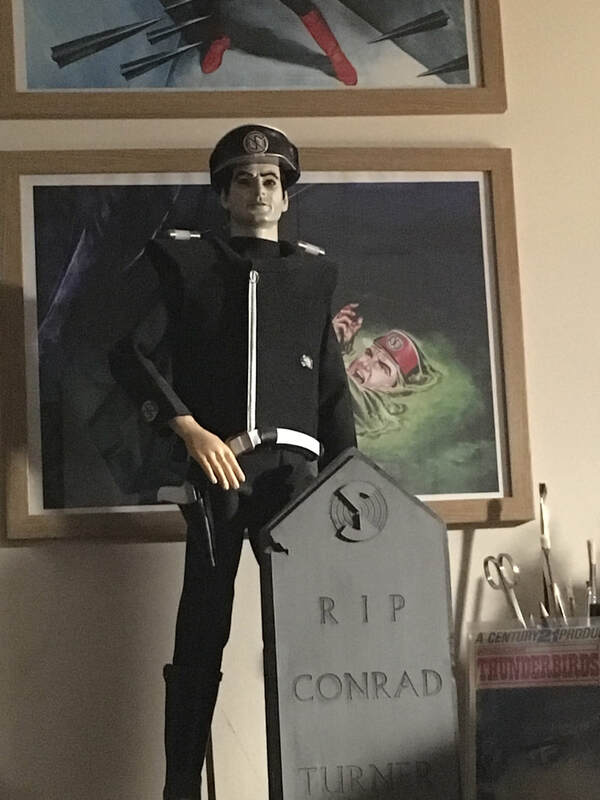 NEW to this page, but a long-time SUPERPROPREPLICATION kit customer is James from Leighton Buzzard with this magnificent Mysteronised Captain Black build, complete with the gravestone for his human incarnation. 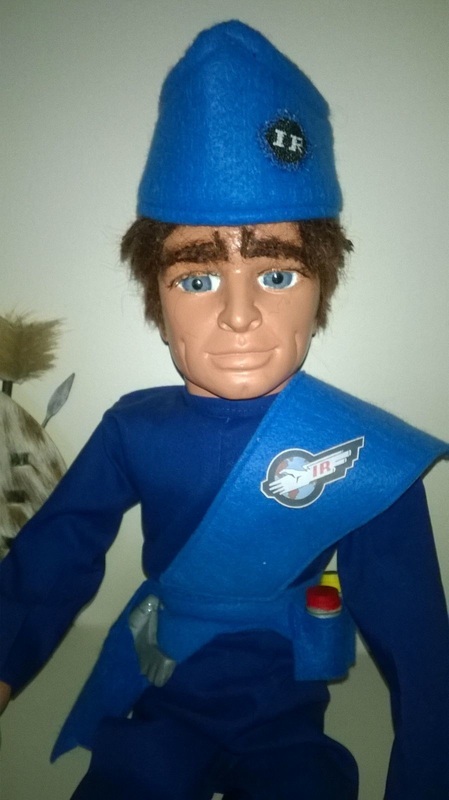 I happen to know that James has also very nearly finished a replica Scott Tracy puppet, as well as a scratch-built puppet-scale replica of his Thunderbird 1 pilot's seat; something that will be a first for this Website, and a puppet/prop combination that I'm very much looking forward to seeing completed. 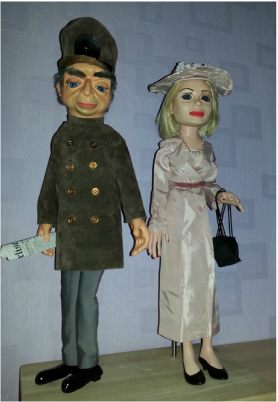 Two more superb builds from Mark in London - Phones from Stingray, and Grandma Tracy from Thunderbirds. 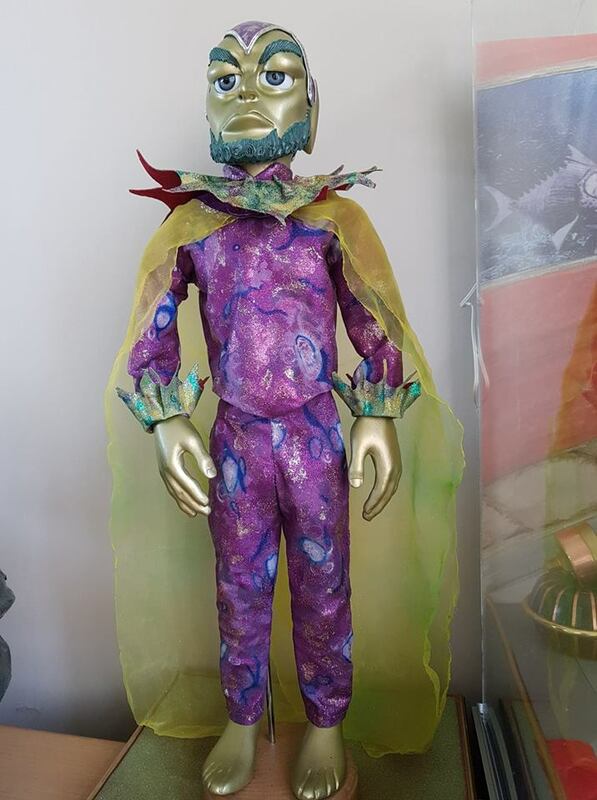 It's wonderful to see a familiar character such as Phones reproduced in such a unique and distinctive costume - a replica of his traditional Scottish attire from a dream sequence in the Stingray episode 'The Loch Ness Monster'. 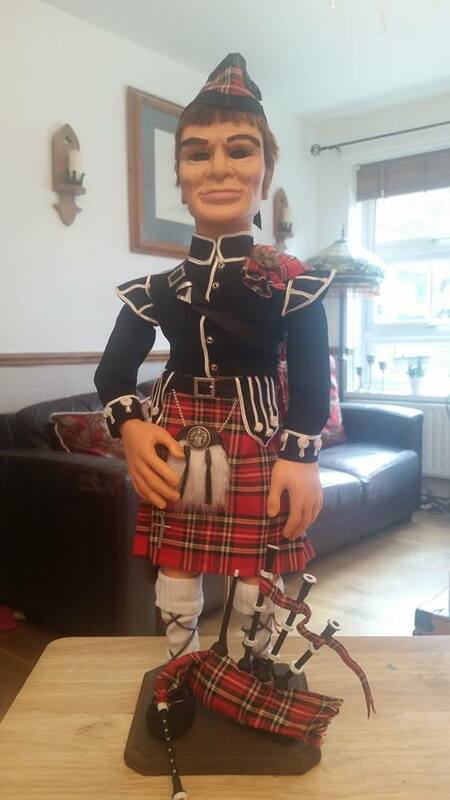 The quality of the work that has gone into making Phones' kilt, sporran, bagpipes and the rest of his outfit is absolutely breathtaking. Mark has reproduced Grandma in her outfit from 'Move and You're Dead'; her rocking chair is a great way to pose her. 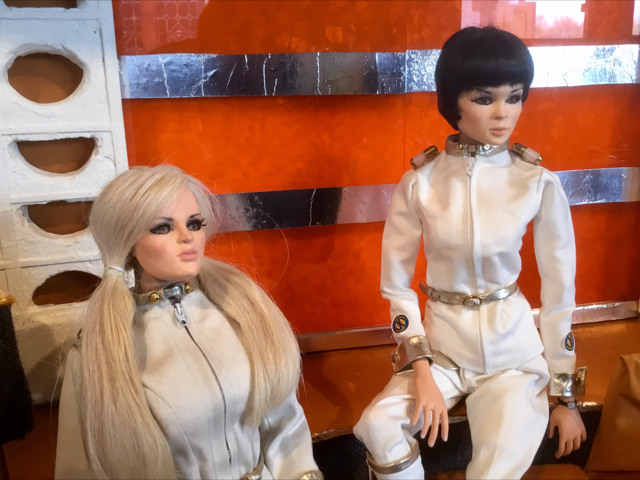 As I'm currently unable to supply casts of Grandma's head, Mark sourced that elsewhere and adapted one of my standard Thunderbirds female bodies to complete her. Mark in London has done it again! 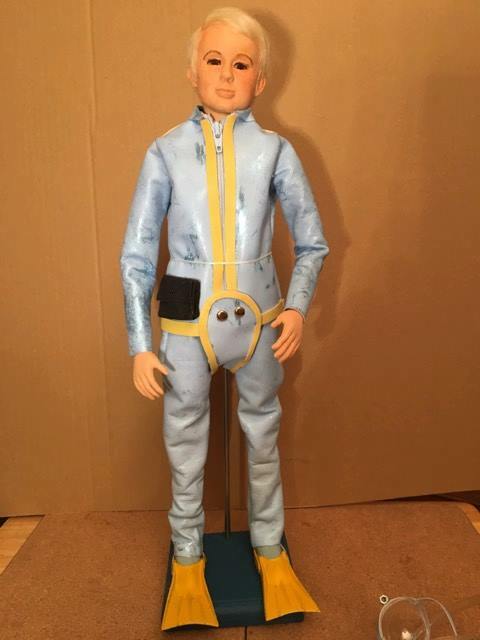 Here's his gorgeous replica of Tin-Tin wearing a copy of the ski suit that she wore in the Thunderbirds episode 'The Cham-Cham'. I have never before seen this outfit replicated; it's a superb choice of clothing for Tin-tin and Mark has made a lovely job of it. 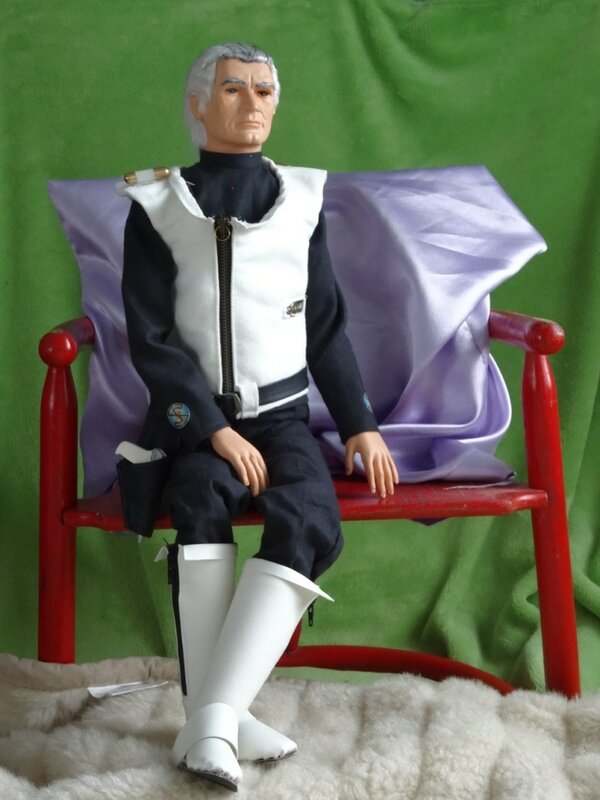 Further down this page you can see Mark's Destiny Angel from Captain Scarlet with her Interceptor Ejector Seat and also his Troy Tempest in his Stingray Injector Seat , all made using SUPERPROPREPLICATION kits. 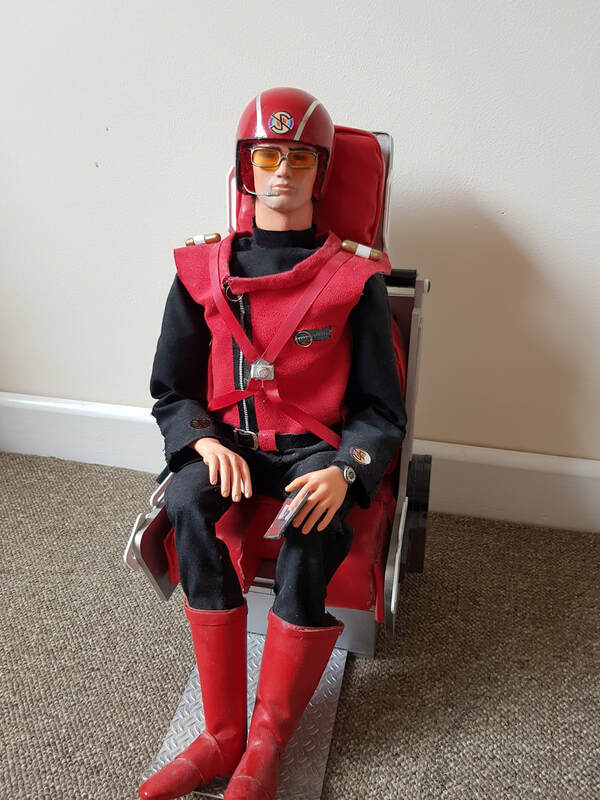 After completing Troy Tempest and his Injector Seat from Stingray (see below), Mark in London has moved on to the later series Captain Scarlet, and has just finished making this beautiful Destiny Angel with her Interceptor Ejector Seat using SUPERPROPREPLICATION kits. Brilliant work Mark, thanks again for sharing. I know you are already planning your next project; I look forward to adding it to this page when you have finished the build. 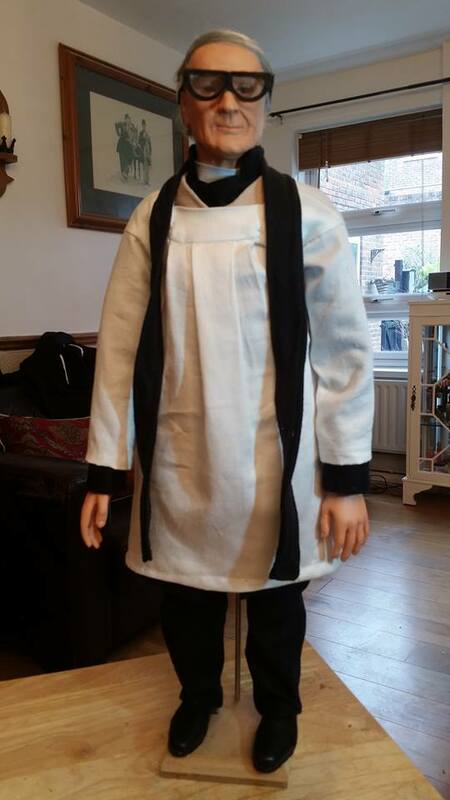 Not many Superpropreplication customers have made a replica Colonel White puppet, but Isabelle in Canada has, and she's made a lovely job of him too! I particularly like the picture of him sitting on the windowsill with a beautiful snowy Canadian landscape in the background. Great work Isabelle; I'm looking forward to seeing your next completed project, and maybe some more of your beautiful Canadian countryside as well. 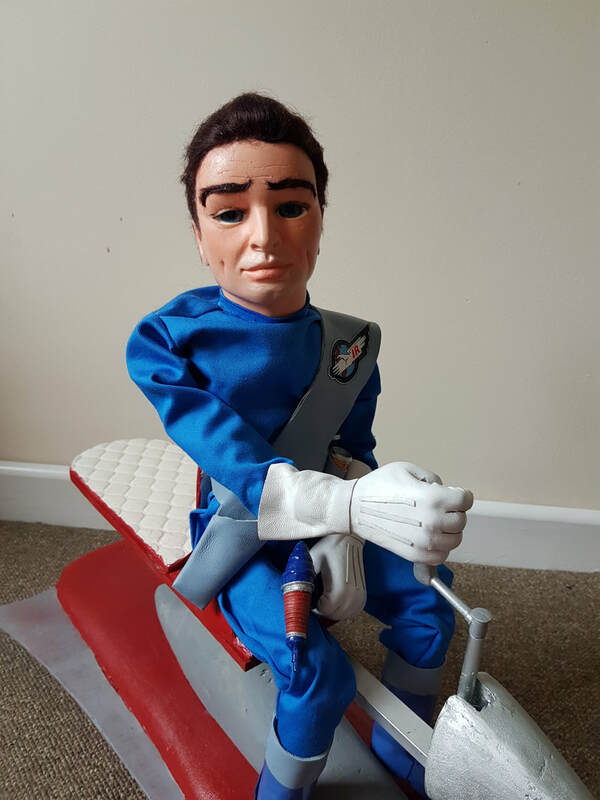 Mark, in London has made himself this fantastic Troy Tempest and his Injector Seat from STINGRAY using kits supplied by SUPERPROPREPLICATION. I'm looking forward to seeing more of Mark's puppet and prop recreations - I know he already has another project in the works. Brilliant work Mark! Thanks for sharing. 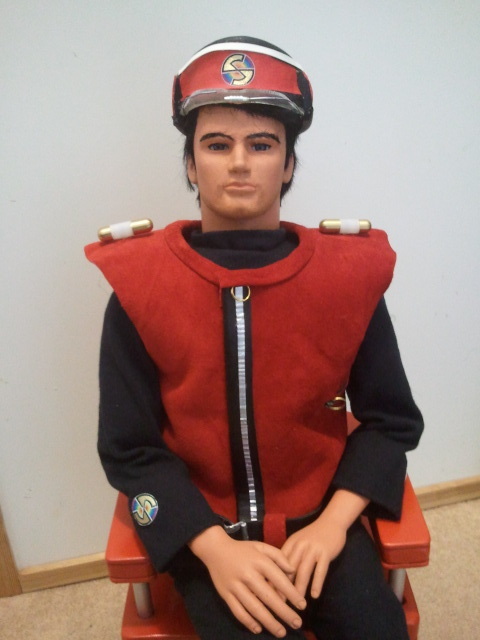 Michael in Manchester made this superb Captain Scarlet replica using a SUPERPROPREPLICATION kit. Michael has clearly got a talent for this, and is already working on making Captain Blue to keep Scarlet company. Brilliant work Michael; many thanks for sharing it with us here. 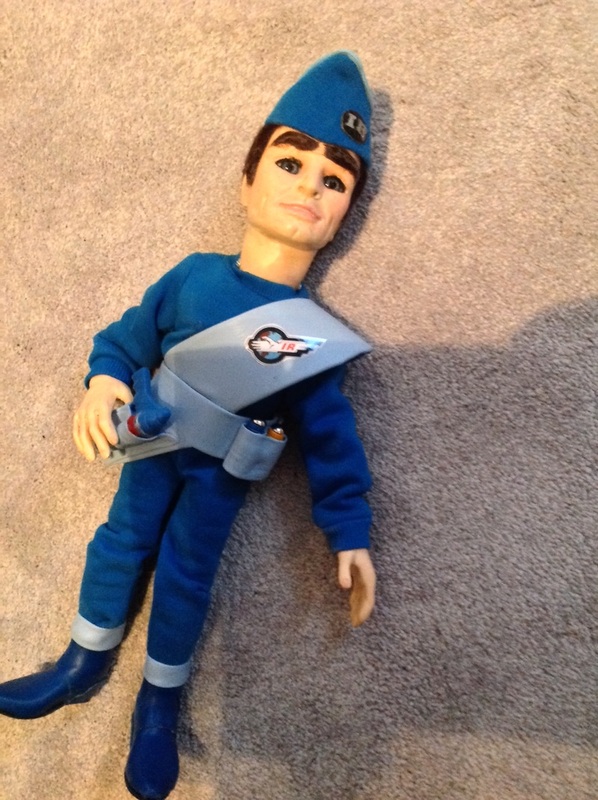 Andrew, in Cumbria, England has made this Parker; his first-ever replica Supermarionation puppet. 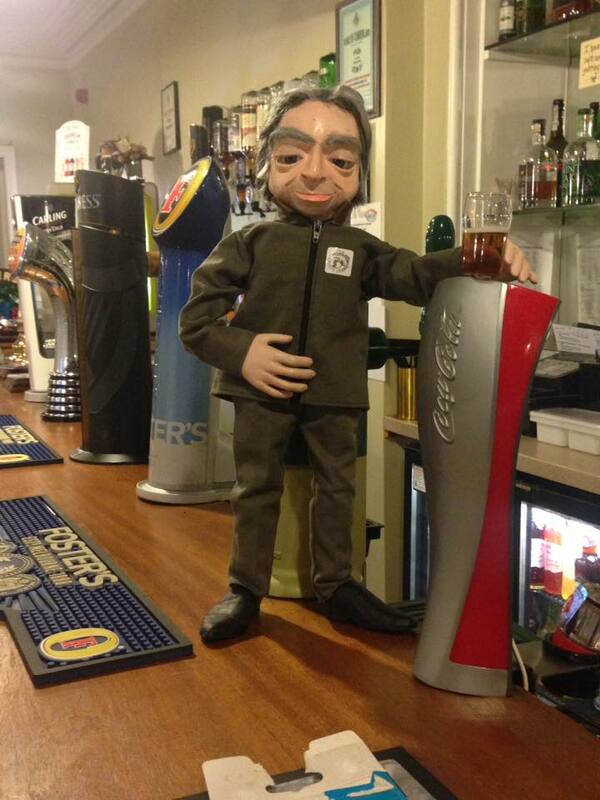 Not only has Andrew made a brilliant job of building Parker, but he has also photographed him in a pub with a glass of beer in his hand. This picture made me genuinely LOL. BRILLIANT WORK, Andrew, I'm already looking forward to seeing pictures of your next puppet project. 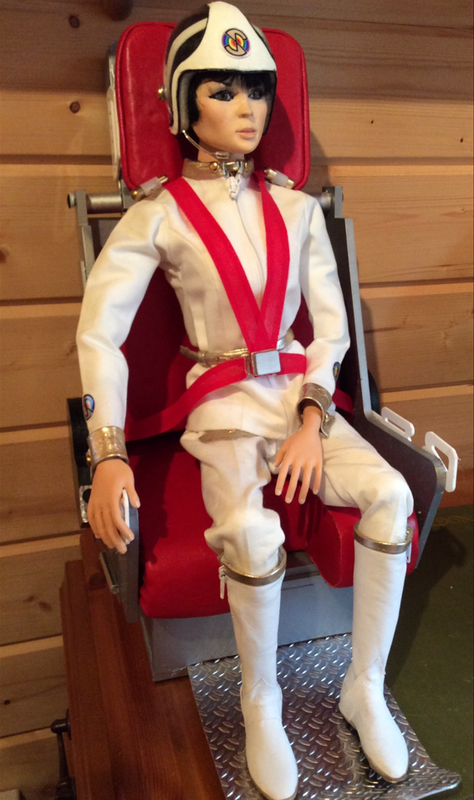 Mike, from The Wirrall has recently added to his collection by building these superb Captain Scarlet and Cloudbase Seat replicas using kits which he bought from me. 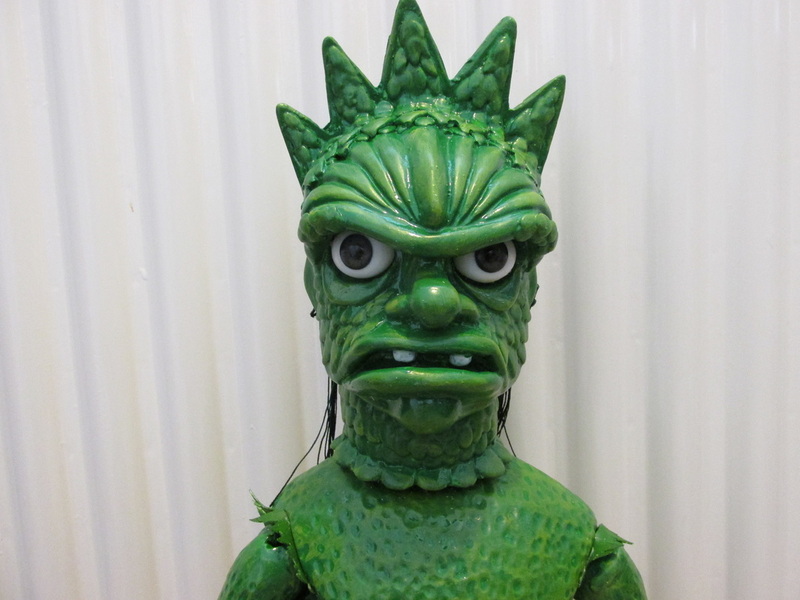 Mike has also made a fantastic Scott Tracy head display using one of my early generation head casts. 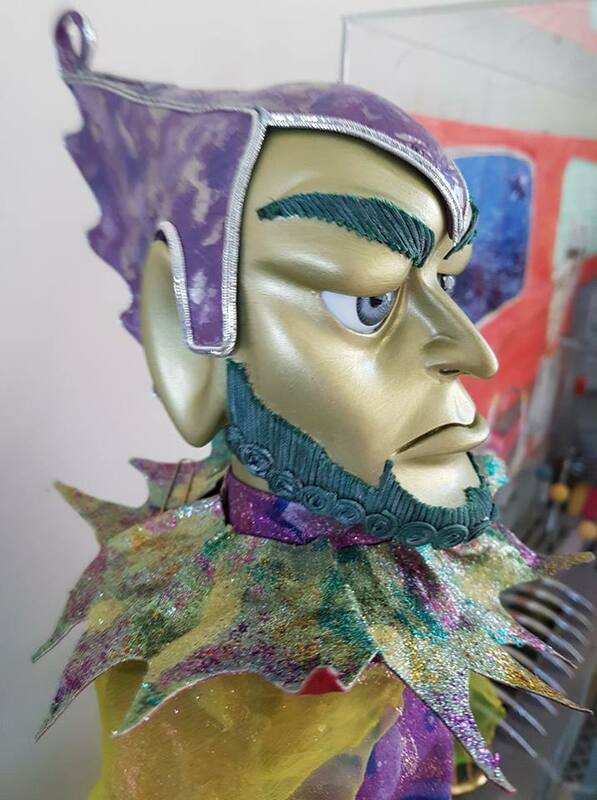 Many people have concerns about whether they can cope with making replica puppets from kits - particularly with regards to wigging and making the costumes. I would never claim it's easy, but Mike and the other clients featured on this page prove that it can be done with a bit of determination and effort. Scroll further down the page to see Mike's very impressive Aquaphibian build. 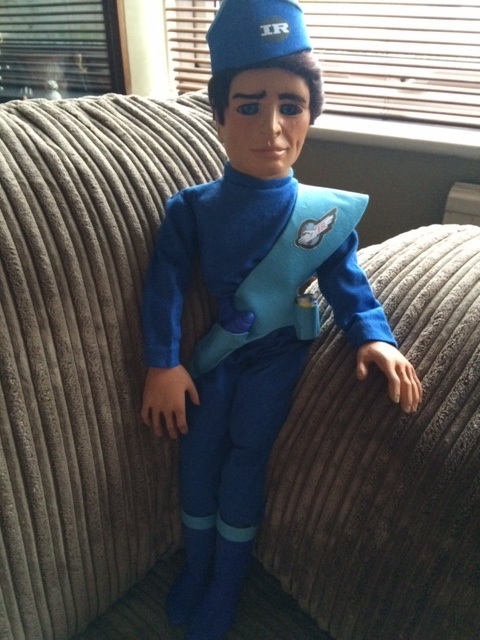 Mal in Somerset has been inventive and creative with his first Thunderbirds puppet replicas. 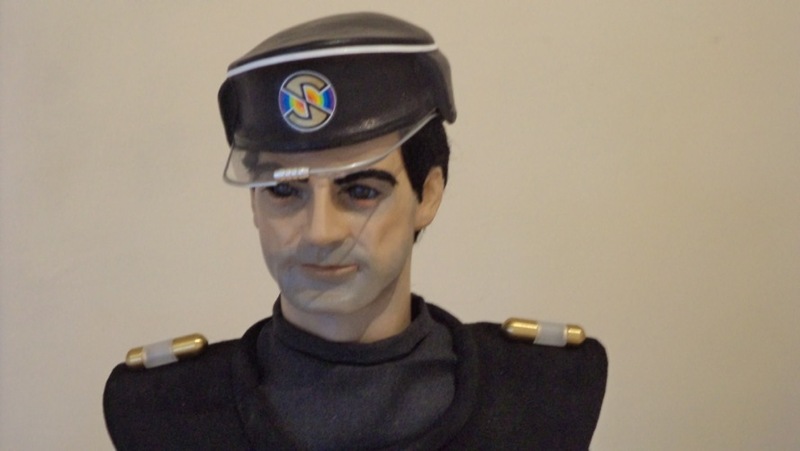 Mal bought a Scott kit from me and a Parker head; he painted in Scott's eyes, and fitted Parker's head to an artist's mannequin body before replicating Parker's chauffeur' outfit. 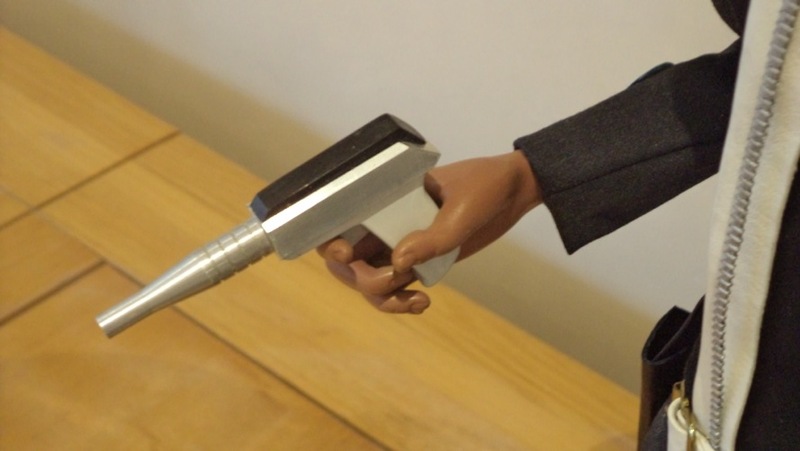 Mal's work shows that you can make really nice replicas without having to go the whole hog if you don't want to. Many thanks for sharing Mal! 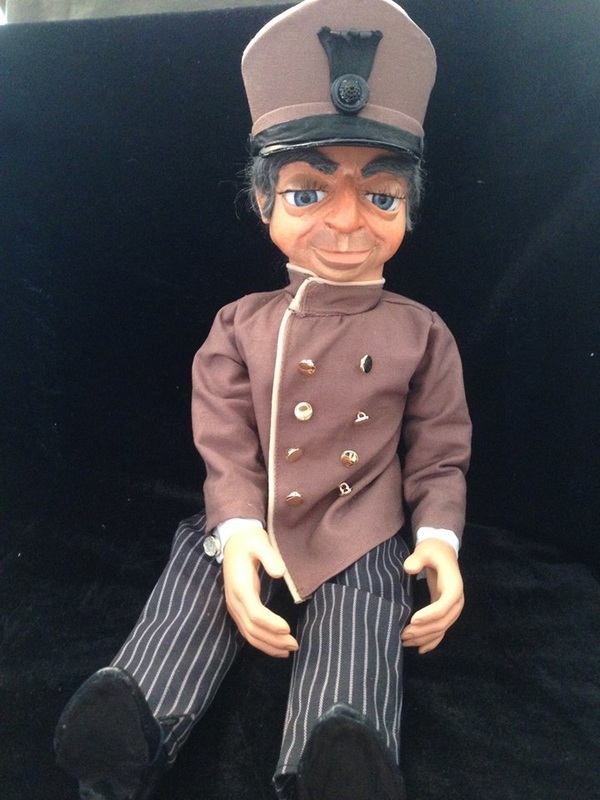 Mark, from London, has made this fantastic replica Parker in his chauffeur's uniform using one of my kits. 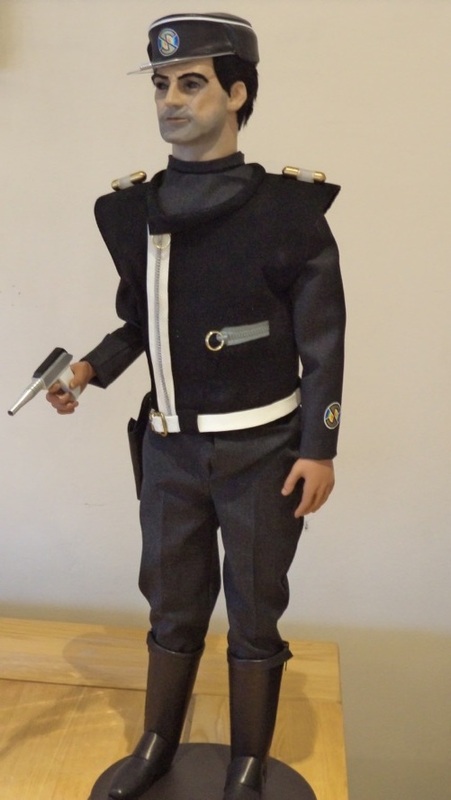 I now supply Parker with basic patterns to make either this uniform and cap, or his butler's outfit. Keep up the good work Mark, you're off to a flying start! 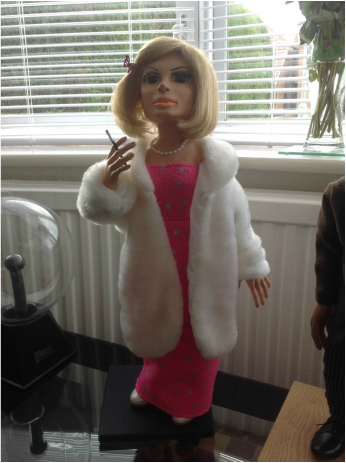 Mark has made this beautiful Lady Penelope replica to display with Parker, and hopefully keep him in check. 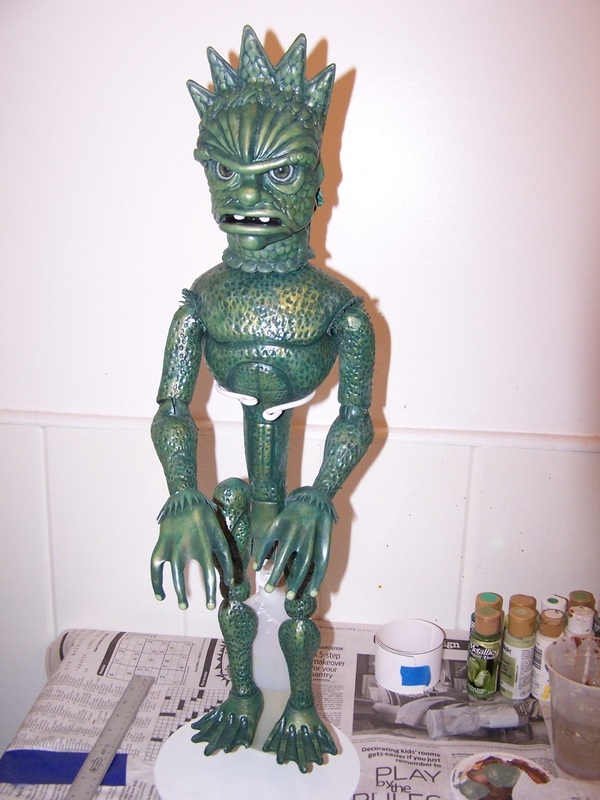 This beautiful Aquaphibian was made from one of my kits by Mike from The Wirrall. 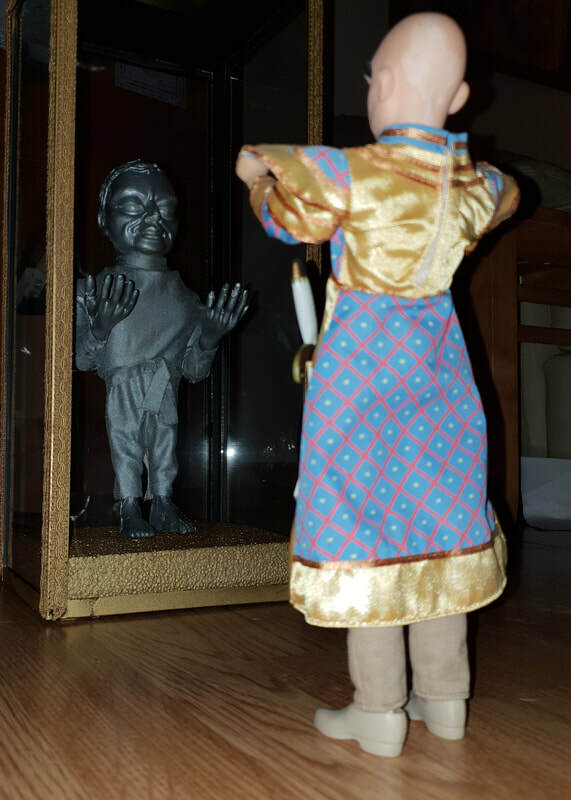 Mike had never made a replica puppet before, so he decided to start with an Aquaphibian to learn the basic jointing and painting techniques before moving on to wigged, clothed puppets. 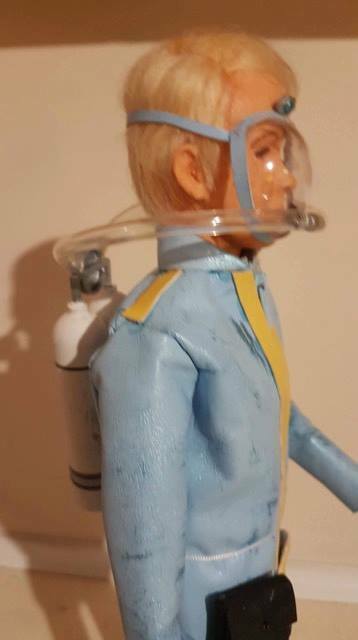 Mike has made a superb replica Aquaphibian; he's clearly a natural at this. Here's a great first-ever build that was a joint effort by Neil, Paul, Brenda and Louise from Hull. The Scott kit was bought as a Christmas present by Louise for her boyfriend. 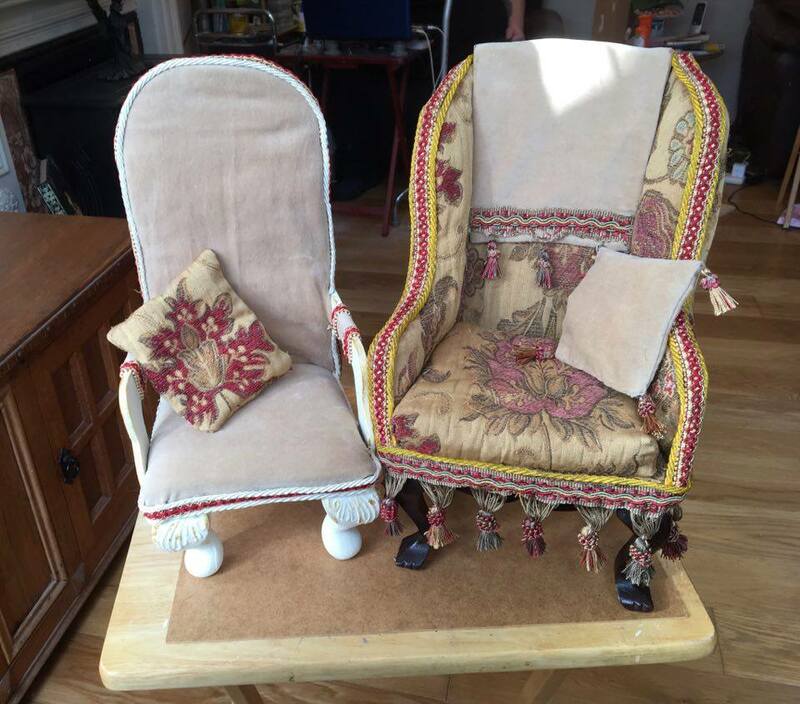 Louise says " It was hard work, but very enjoyable and definitely worth the effort." 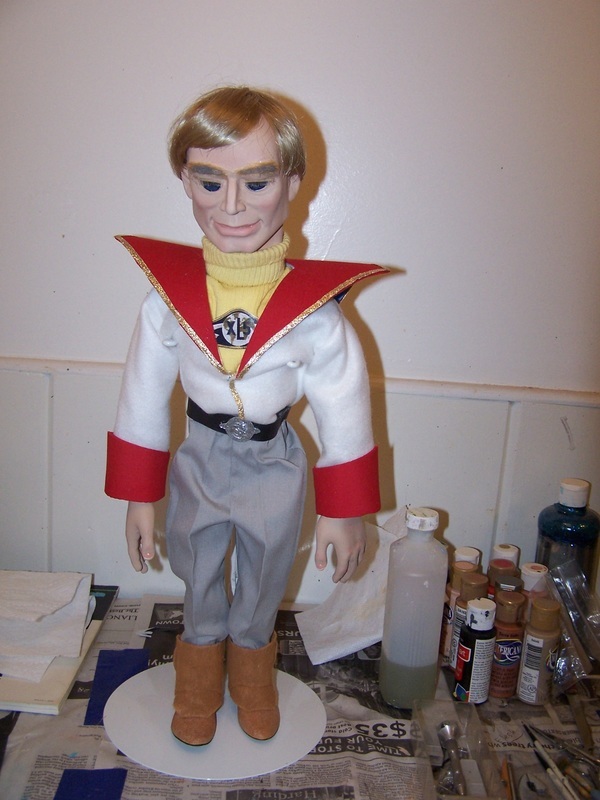 I would never claim that making replica Supermarionation puppets is easy, but I can say that it does get a little bit easier with every new one that you make. Carl in Manchester is a SUPERPROPREPLICATION STAR! You will find Carl's work extensively represented on this page, as he is undoubtedly my biggest single customer for kits. BEAUTIFUL work as always Carl; many thanks for sharing! Bill in Milton Keynes bought one of my Parker kits, never having made anything like this before. 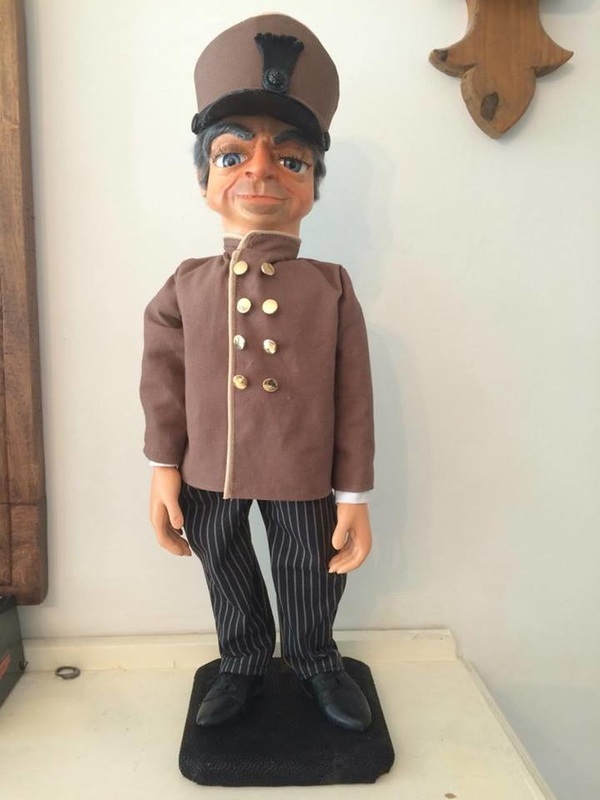 He has produced this wonderful replica Parker puppet with his kit by following my 7 page puppet-building guidelines (supplied free by email with every kit). Bill has given his replica Supermarionation puppet a lovely individual touch by placing a puppet-scale newspaper in Parker's hand. 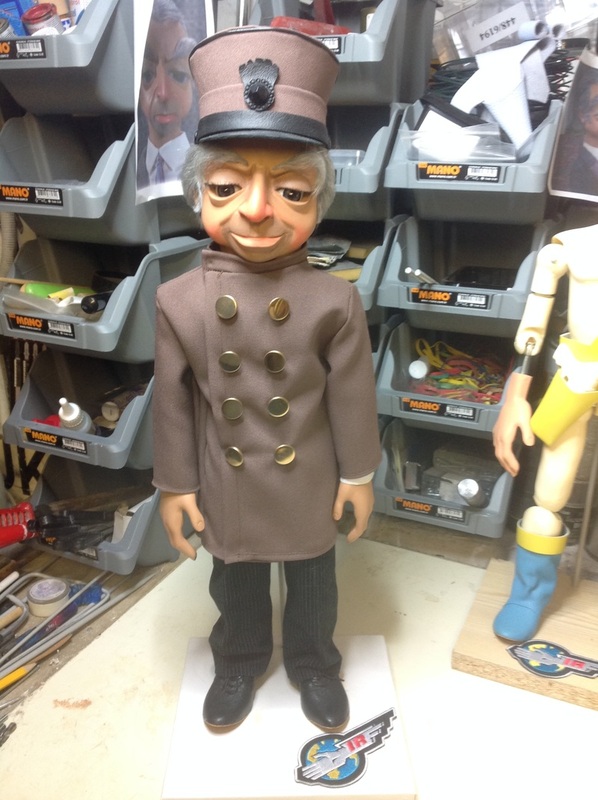 Having previously collected 12" figures, Bill now tells me that he has the bug for making studio-scale puppet replicas. Looking forward to seeing more of your work Bill. Enjoy your new hobby! 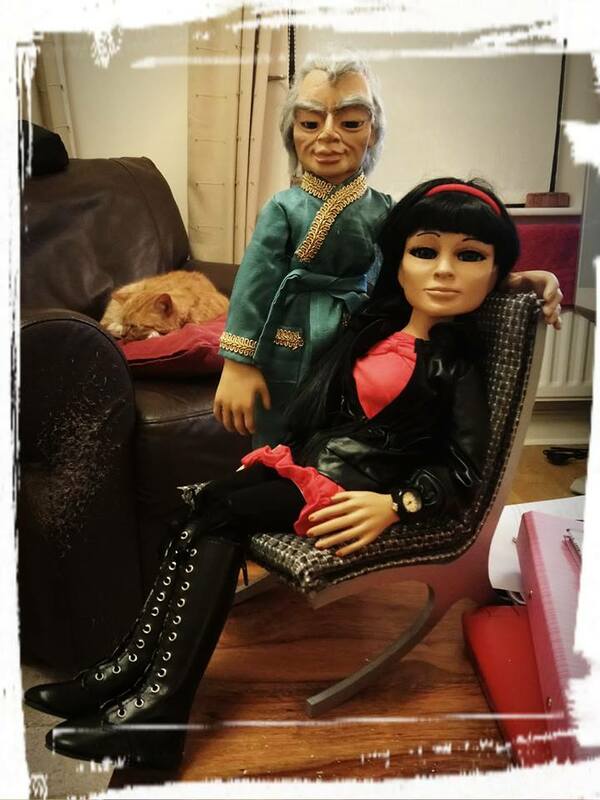 UPDATE - April 2016, and Bill has made Lady Penelope to keep Parker in check. 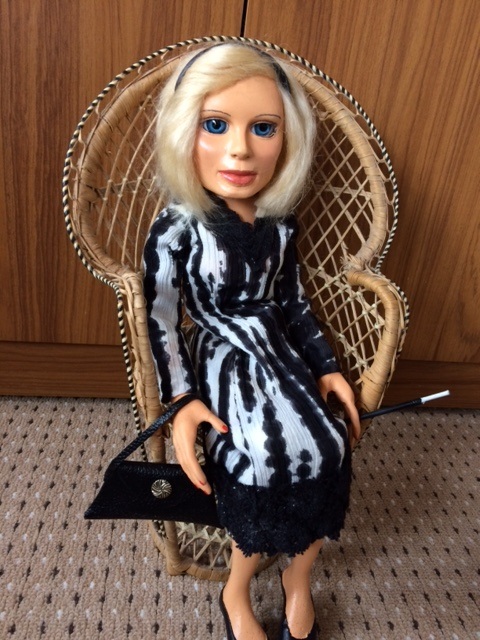 As with Parker, Bill has made beautiful puppet-scale accessories for Penny in the form of a handbag and hat. Great work Bill - keep it up! 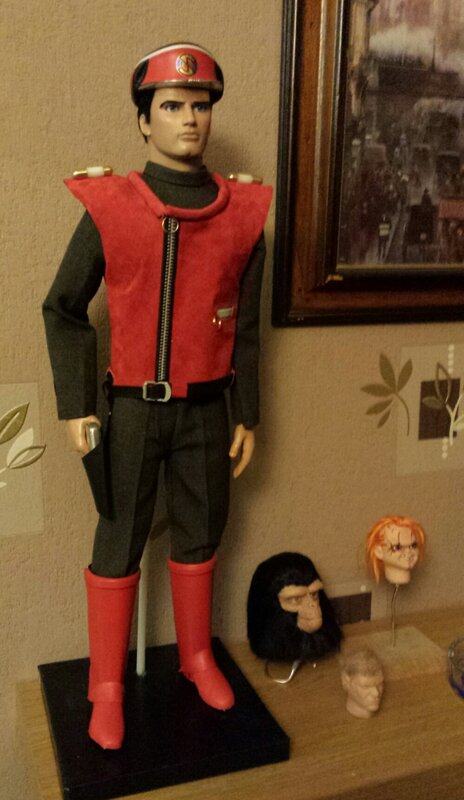 Mark in Wales made these fantastic replicas of Captain Black and Captain Scarlet using kits which he bought from me. 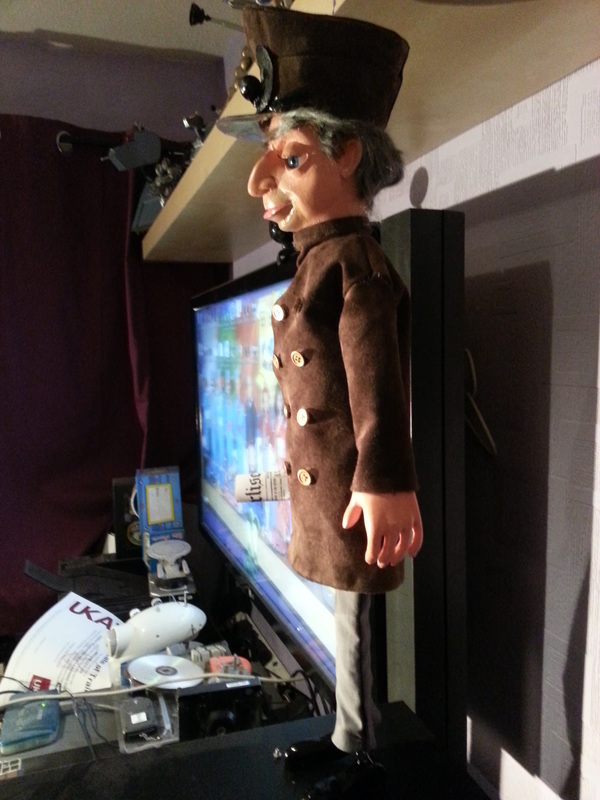 I love the way that Mark has made customised stands for his replica puppets. Beautiful work Mark - many thanks for sharing your pictures. 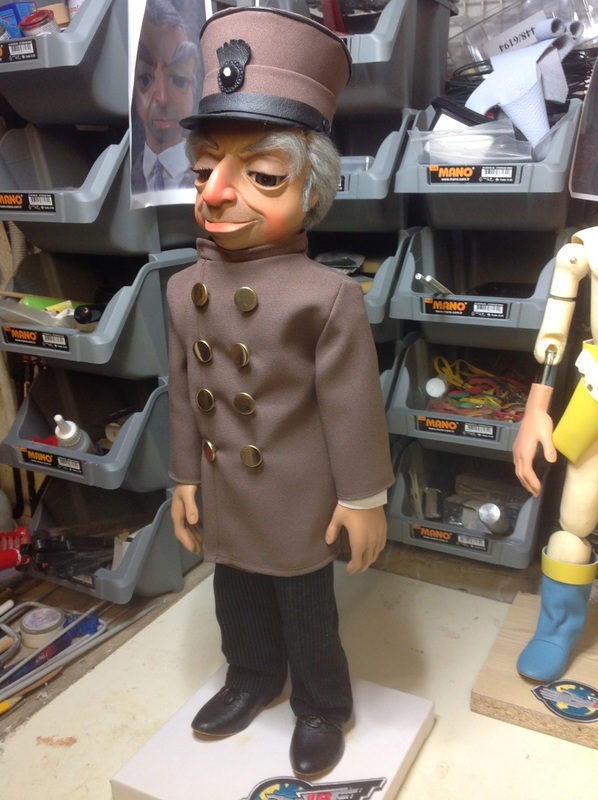 James in Australia kindly shared these pictures of his excellent puppet builds. 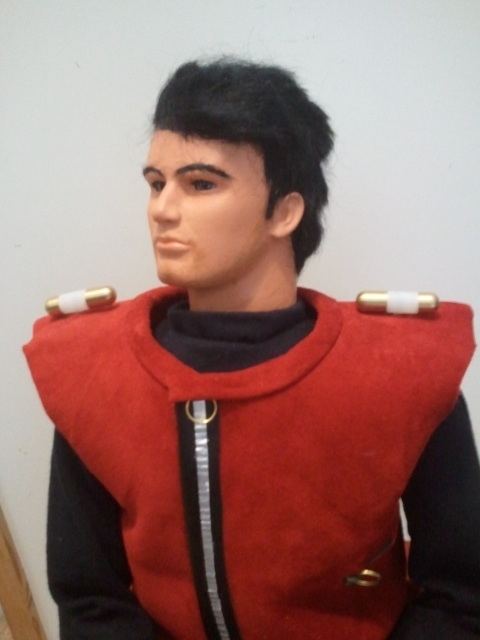 Anyone who, like James, doesn't feel ready yet to tackle wigging a puppet with mohair can take heart from his lovely Mike Mercury and Steve Zodiac replicas which James wigged using modelling clay and then painted to great effect. 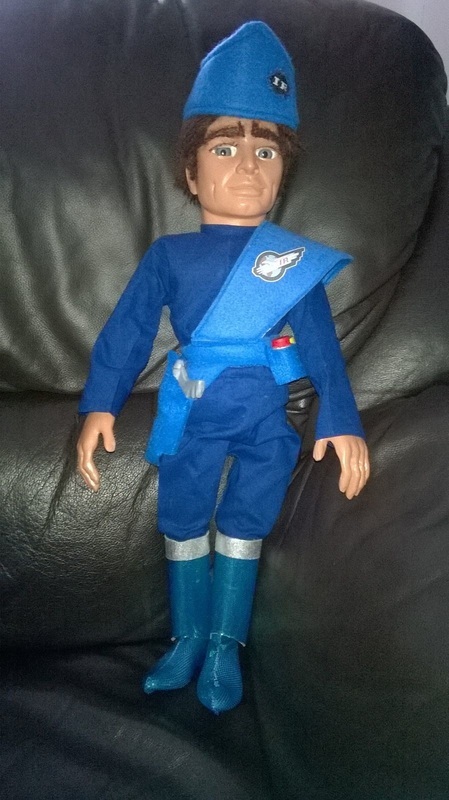 Rene in Canada has made an excellent job of this Scott build, never before having made a replica puppet. Superb work Rene! Many thanks for allowing me to share it here. 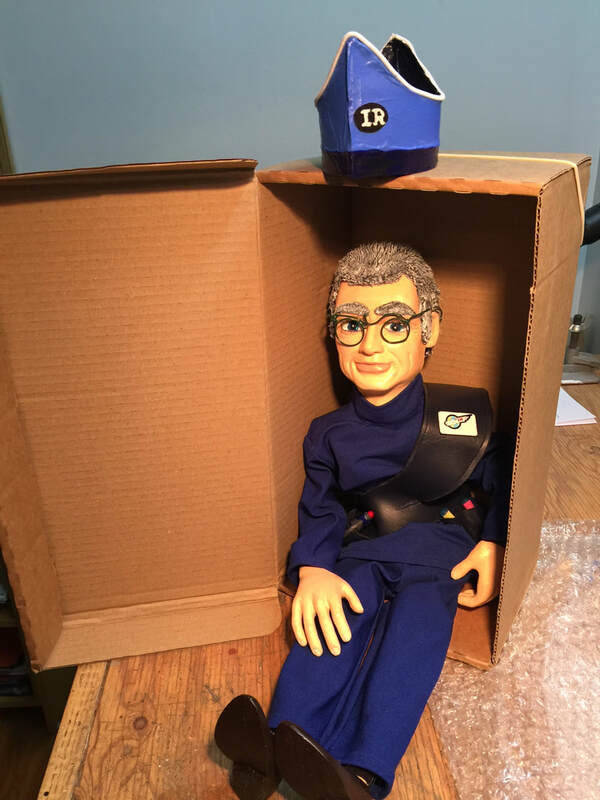 Scott in the USA made this wonderful replica of his namesake in Thunderbirds using one of my kits. 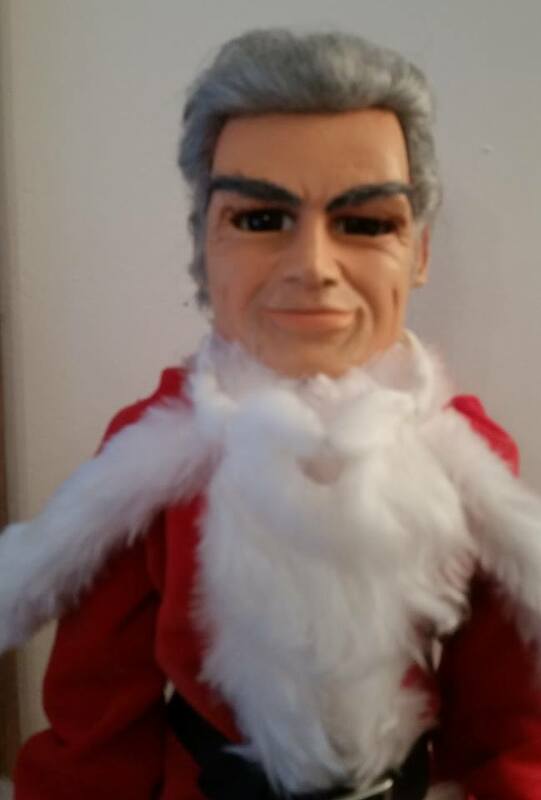 I know that Scott has other replica puppet projects in the pipeline and I look forward to showing his work here. Outstanding work Scott! Thank you for sharing your pictures with us. 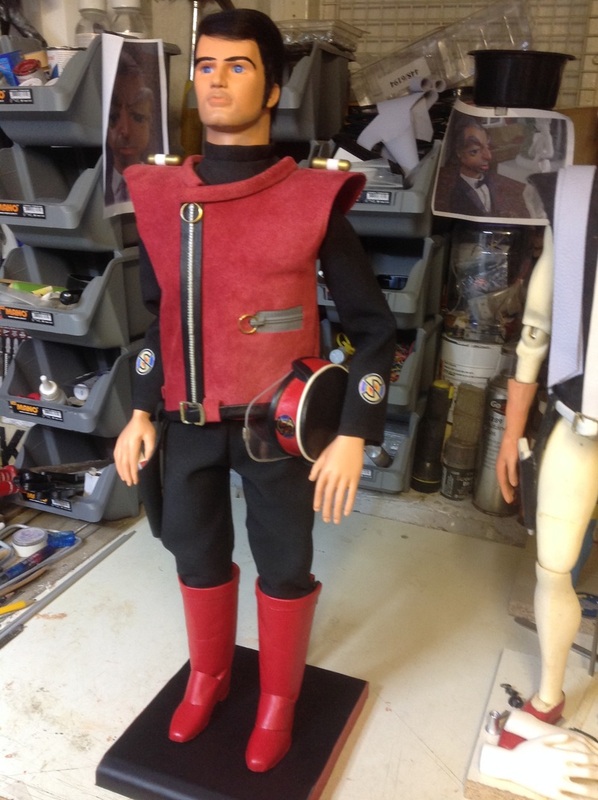 Joe, from Leeds, has made a superb job of his first puppet builds - just look at his Captain Scarlet and Parker replicas, both built from kits supplied by me. Joe's workmanship is seriously impressive. 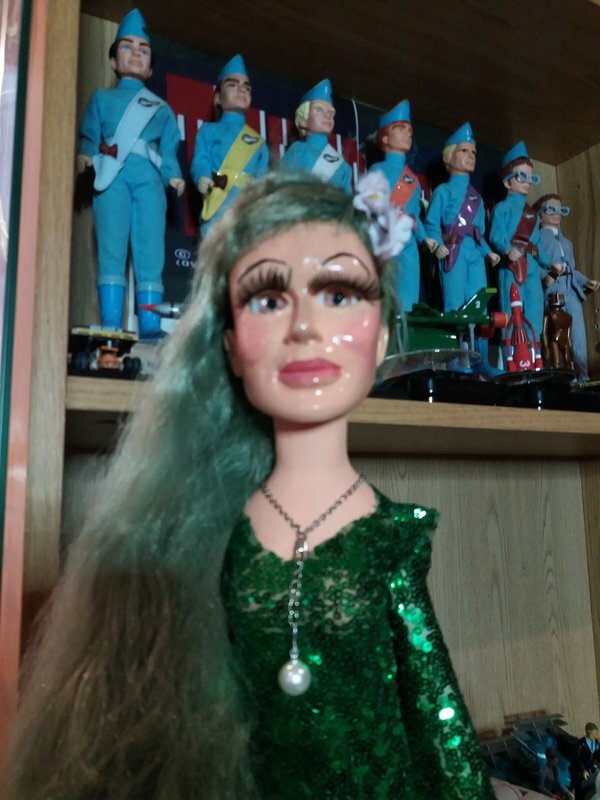 Jill, from Mid-Wales is the first of my customers that I know of to have made Symphony, Melody, Harmony and - using a customised Destiny head - the elusive Rhapsody Angel from kits that I supplied. Jill has even made working flashing epaulettes for her replicas. Absolutely wonderful work Jill, thank you so much for sharing these great pictures. 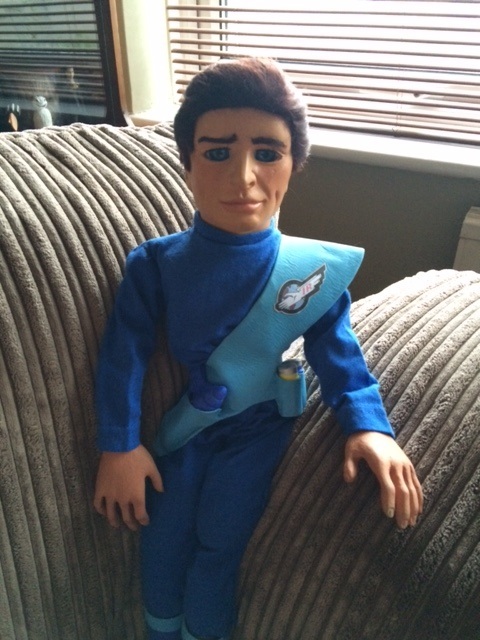 A really nice individual touch is how Jill has recreated an early publicity photo of Rhapsody Angel wearing Captain Scarlet's cap. LOVE IT! 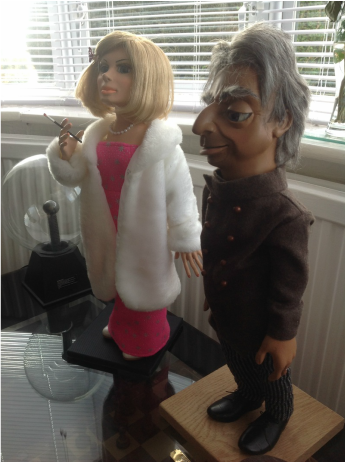 William, in New Zealand, has now made Parker to accompany his Lady Penelope build from earlier this year. Superb work William - thank you for sharing. I have a feeling we'll be seeing a lot more of William's work before long - he appears to have got the bug. 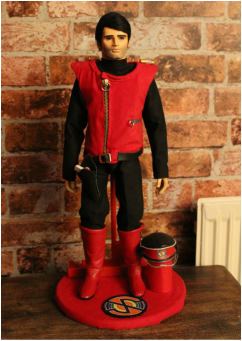 Niall, in Ireland made superb replicas of Captain Scarlet and Destiny Angel using kits supplied by me. My grateful thanks are due to Niall for allowing me to show these pictures of his work here. 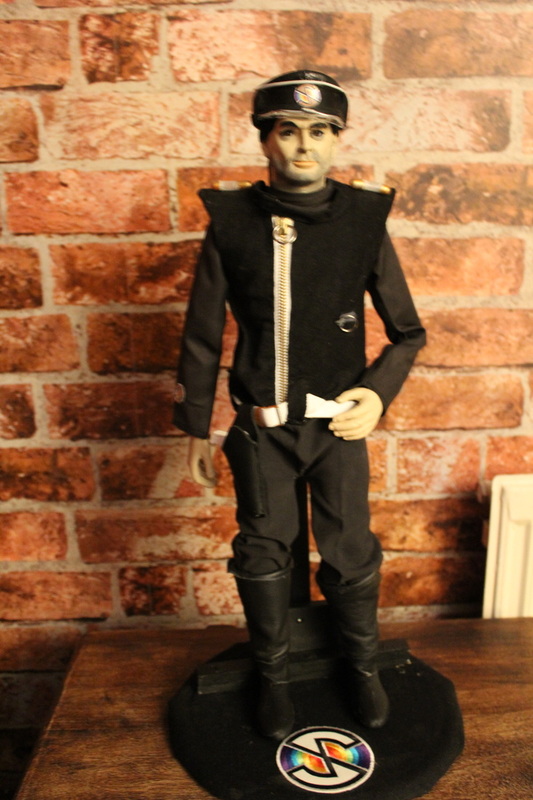 Niall is the first of my customers to make a replica Captain Black puppet using my new 'Mysteronized' head cast, and he has made a really excellent job of it! 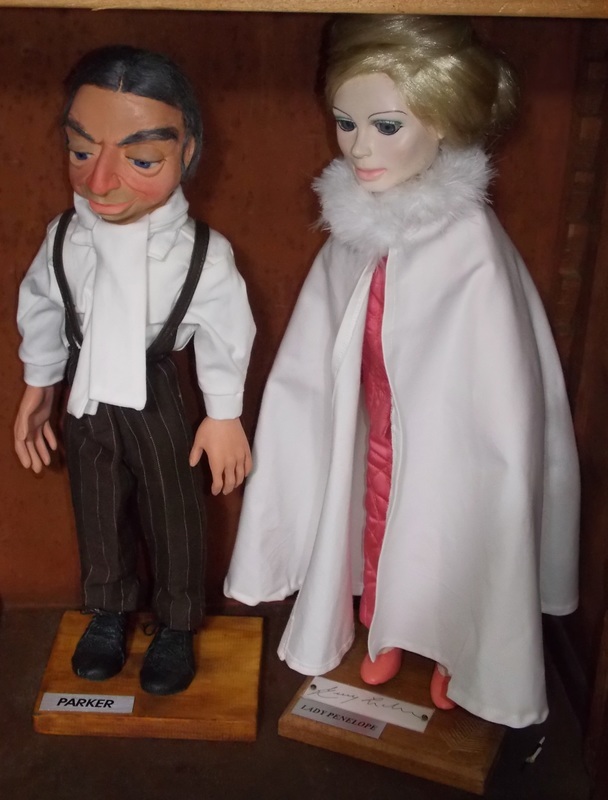 Regular customer and hugely talented replica puppet-maker Carl, in Manchester, made these. Thank you for sharing your pictures Carl, I love your work! 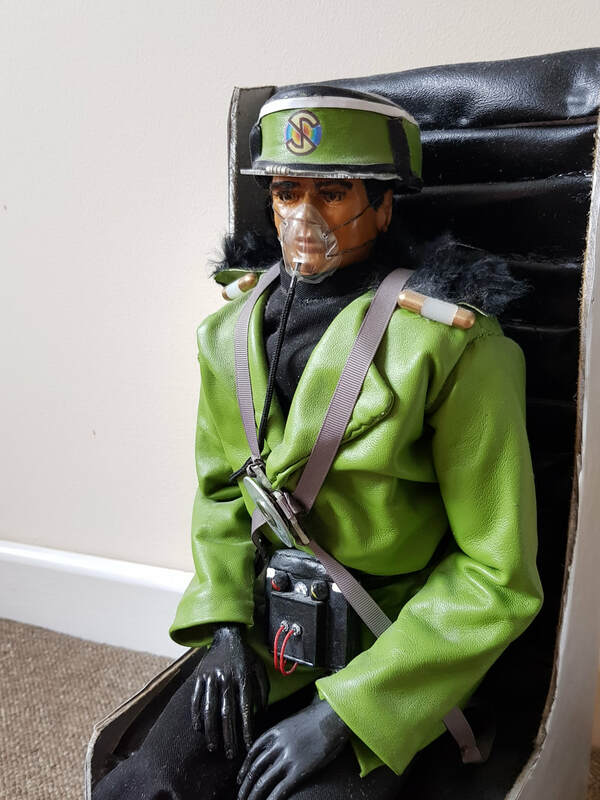 Nick, in Germany, is the first of my customers to complete one of my new Braman kits, and he has done a quite superb job of making it - the following are pictures of Nick's Braman build. Excellent work Nick, thank you for sharing. 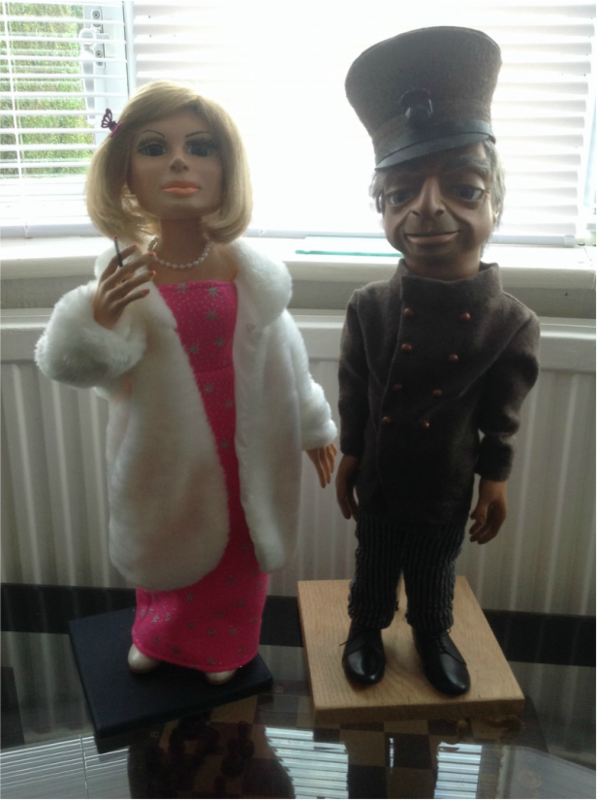 Neil, from Walsall, West Midlands, England, sent me these pictures of his first-ever replica puppet builds of iconic Thunderbirds characters Lady Penelope and her butler/chauffeur, Parker. I think Neil has made a fantastic job of constructing, painting and clothing his kits, and I'm very grateful that he has allowed me to show his pictures of them here. 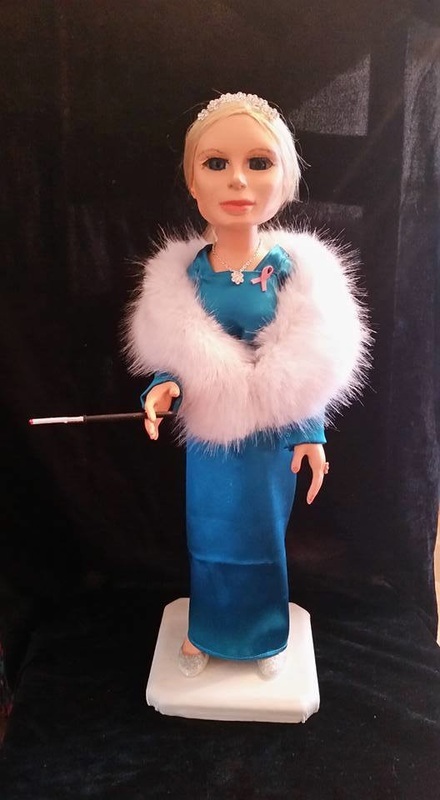 William, in New Zealand, bought a Lady Penelope puppet kit from me in March of 2015, and has turned it into this wonderful finished replica in just a few weeks. Fantastic work William, thank you so much for allowing me to share pictures of your Lady P on her custom base with name plaque. 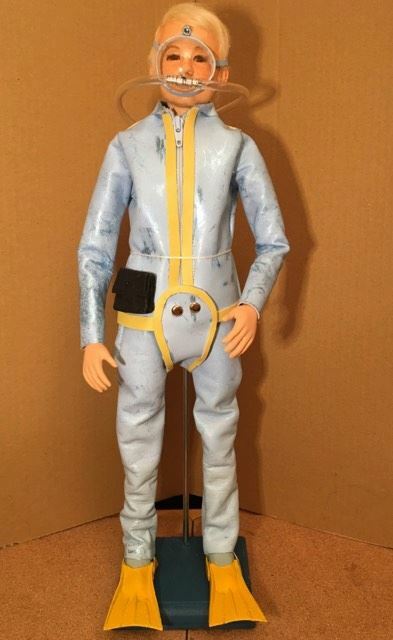 The addition of an original Gerry Anderson signature to the base is a lovely touch. 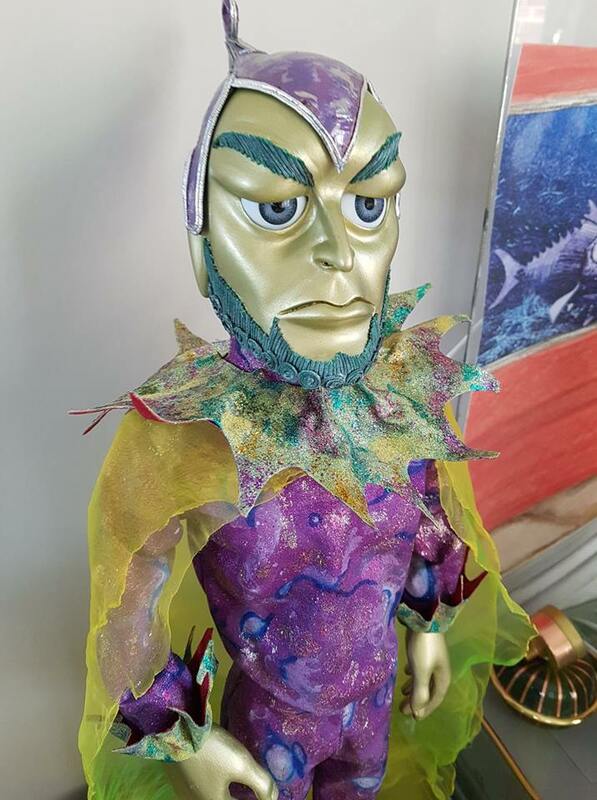 Tony, from Memphis, is another first-time puppet-maker who has done a marvelous job of building himself an Aquaphibian and Steve Zodiac replicas using kits that he bought from me. Ray, from Bognor Regis made this lovely Scott using one of my kits, a really excellent first-time build. Great work Ray, thanks for sharing! 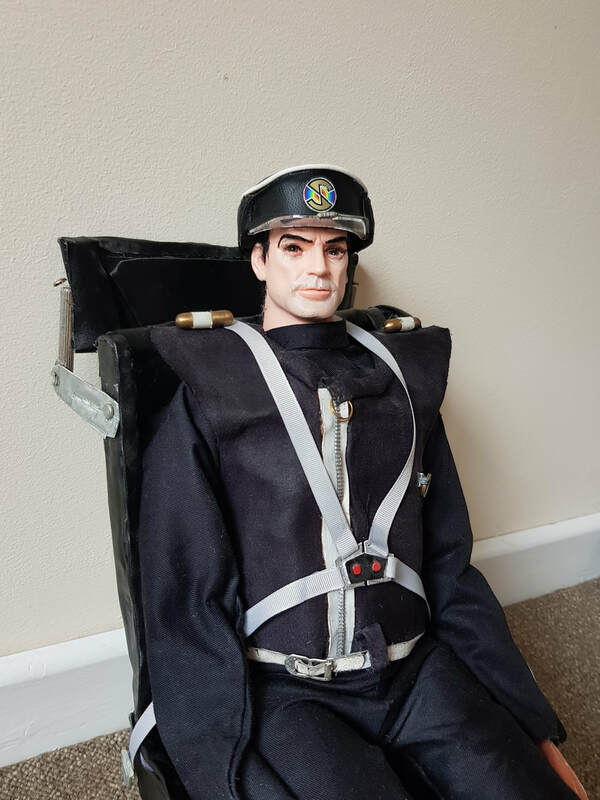 UPDATE - Ray has now also made a superb lady Penelope in double-quick time, and posed her in a puppet-scale seat, all of which looks fantastic! Here's Carl from Manchester again, this time with an extraordinary and unique piece of work. 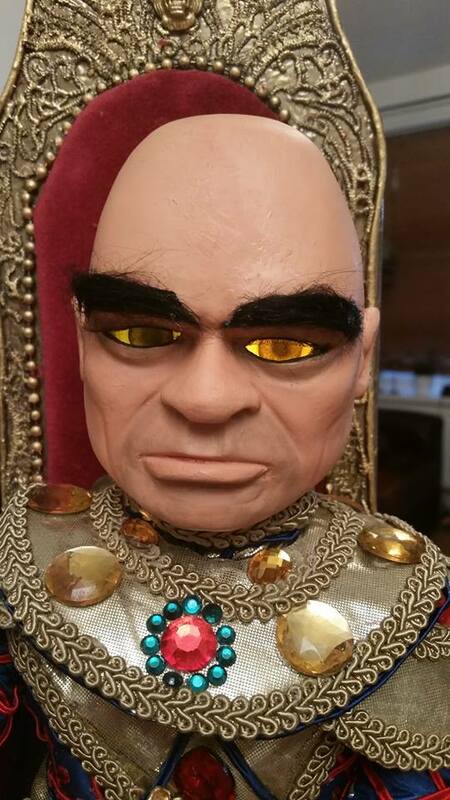 Carl made this quite superb James Bond (as played by Sean Connery in his Goldfinger incarnation) for one of his friends. 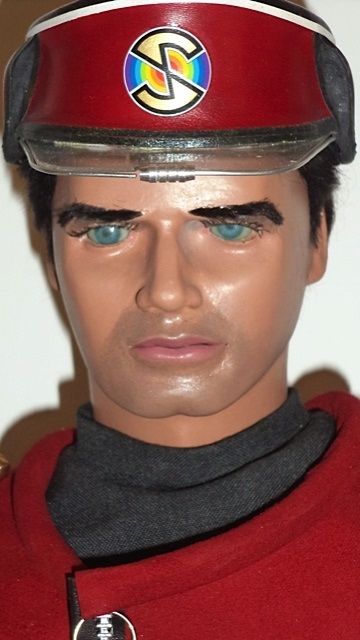 The head is a unique custom-sculpt of unknown provenance, and Carl built the puppet on a standard Captain Scarlet-type replica Supermarionation body. Car hand-sewed Bond's suit and did a quite superb job of it!